This blog has over 70 topical posts. Treat this blog as a online library. 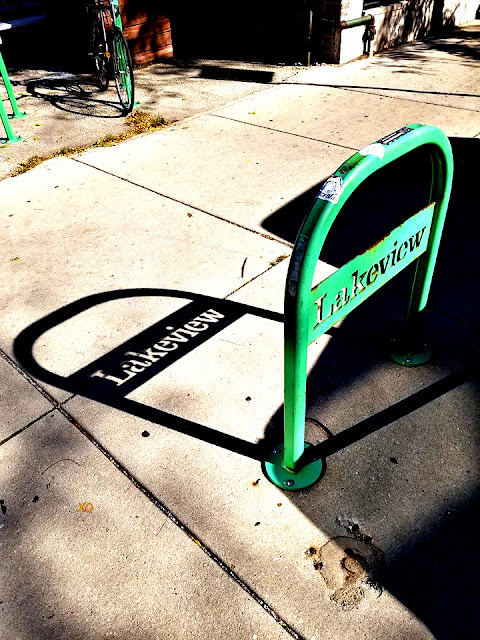 These posts are like a stack of shelves full of books to be used & reused whenever needed. 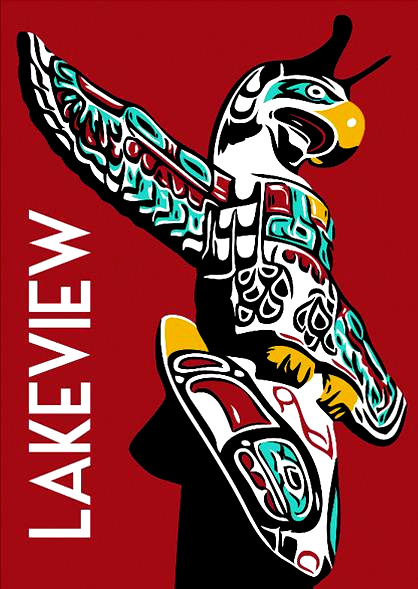 This post is related to other published views on the history of Lake View plucked from several sources. My own sources has its own post. 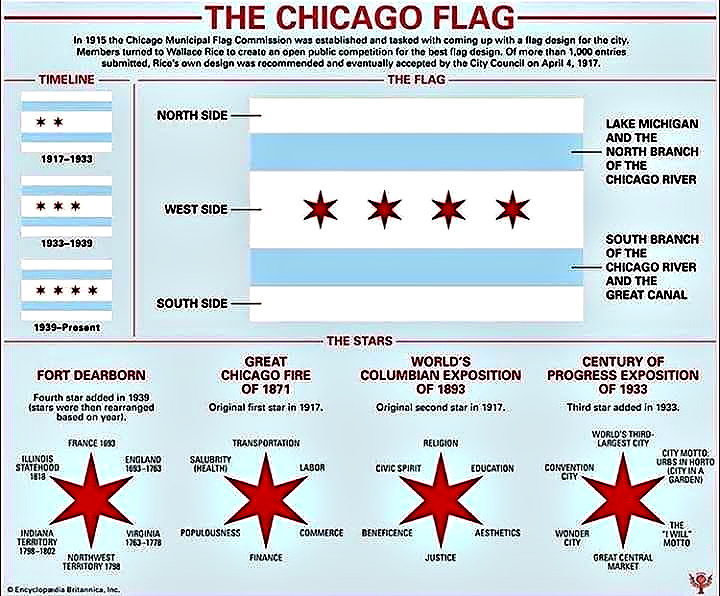 that the city would annex during early 1800's. 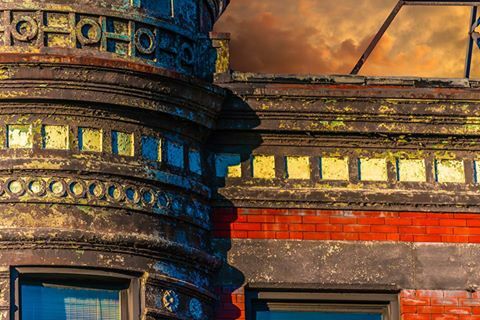 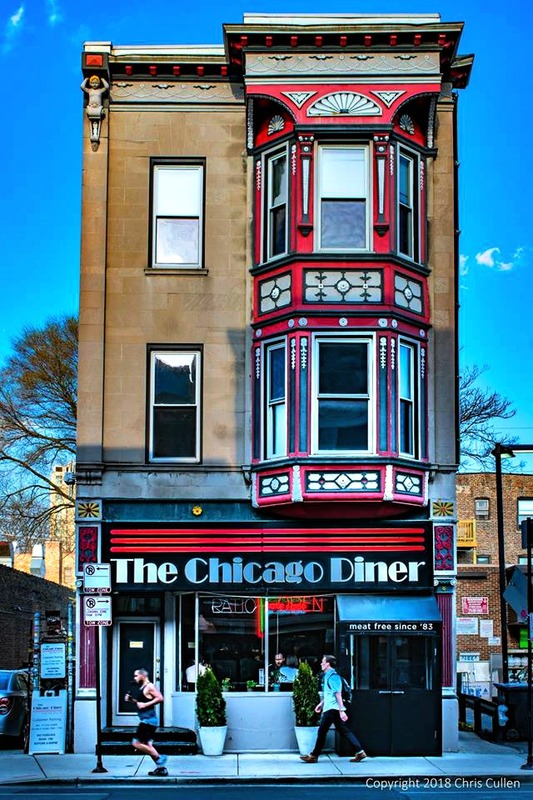 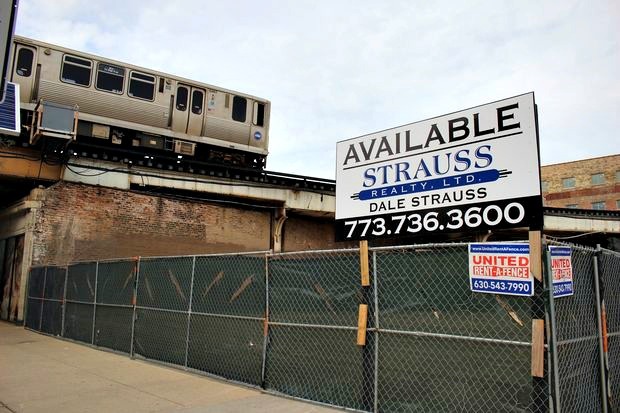 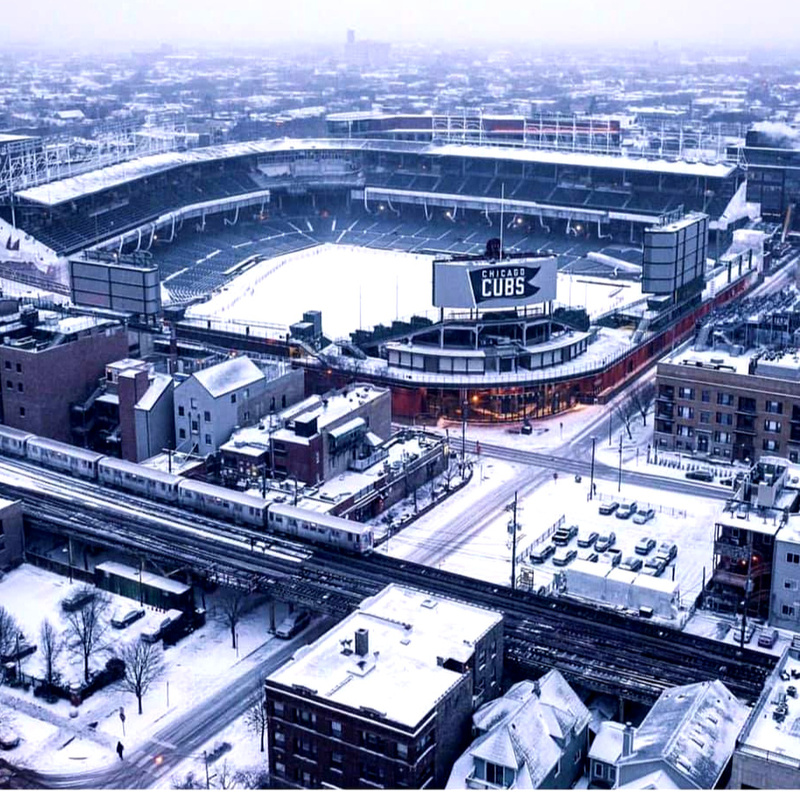 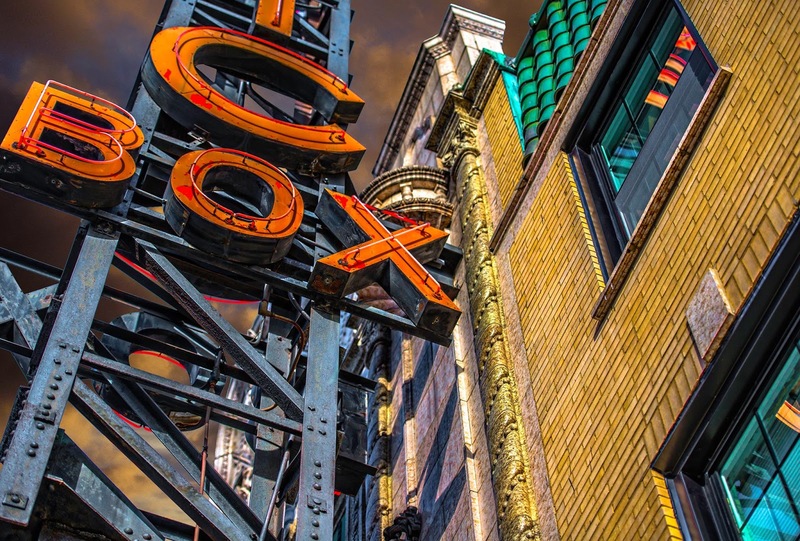 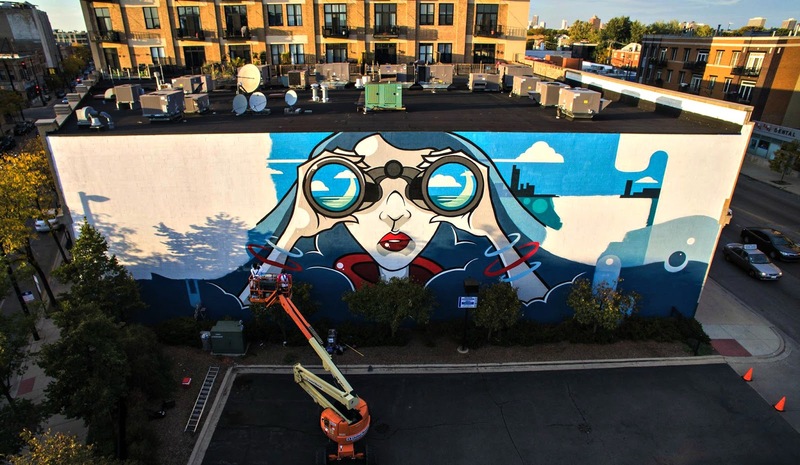 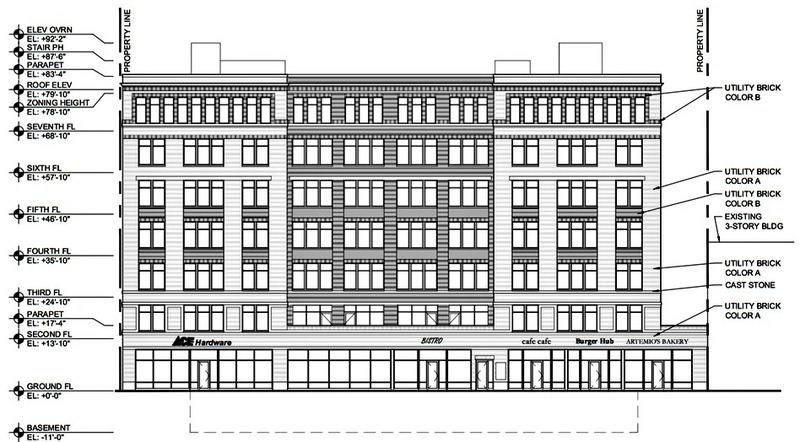 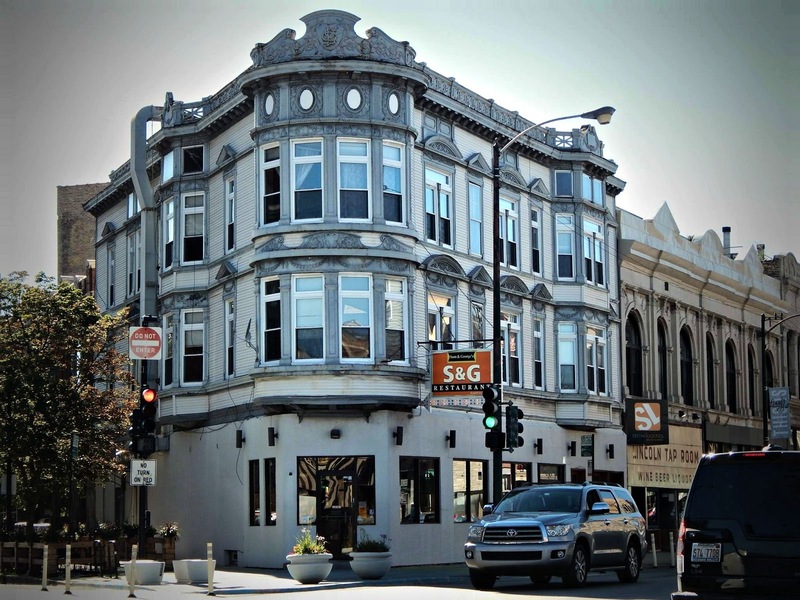 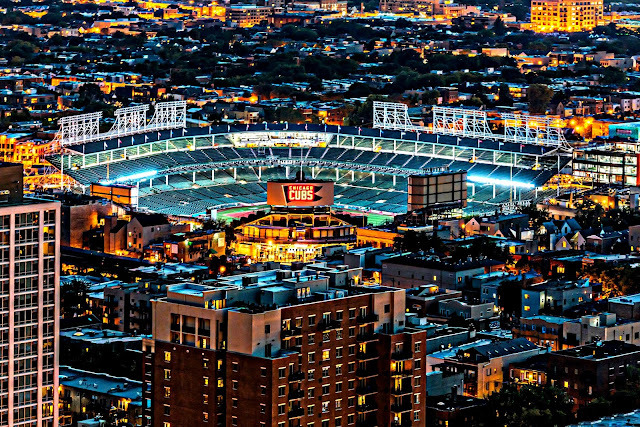 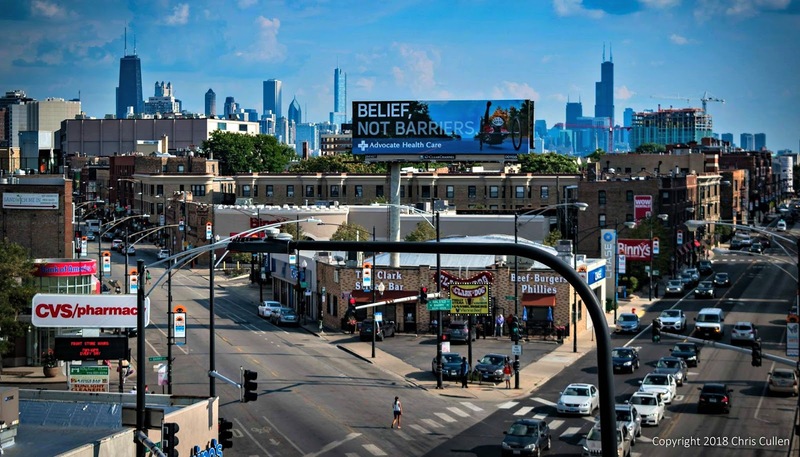 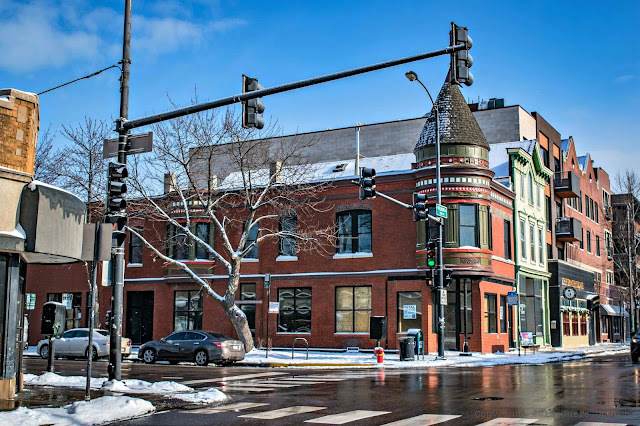 Read a great article from WBEZ's Curious City on the fight not to be annex by the City of Chicago. 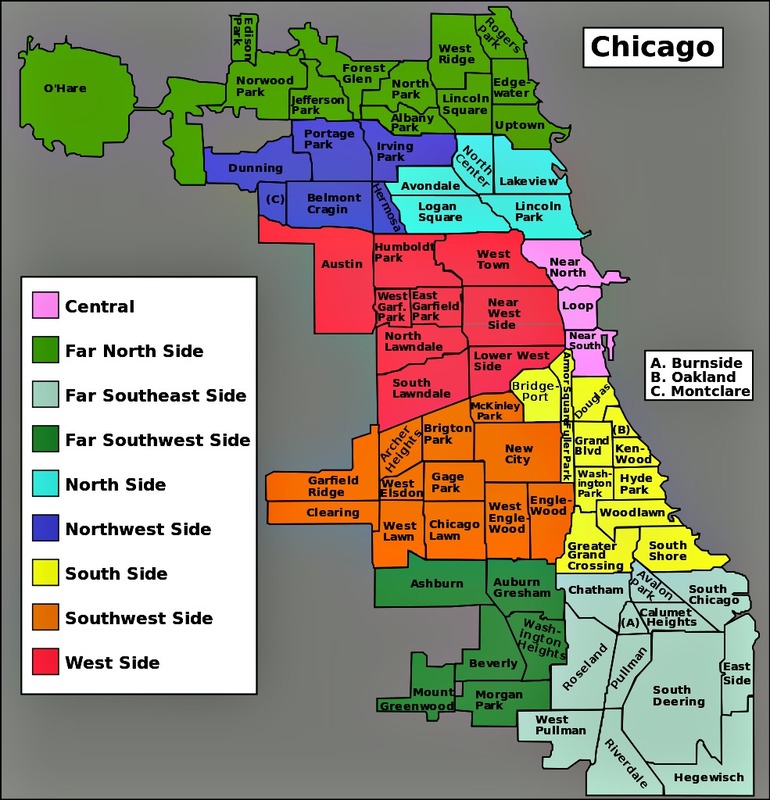 A township is a widely used unit of local government in the United States, subordinate to, and geographic divisions of, a county (Cook for us) within a state. The specific responsibilities and the degree of autonomy vary based on each state. 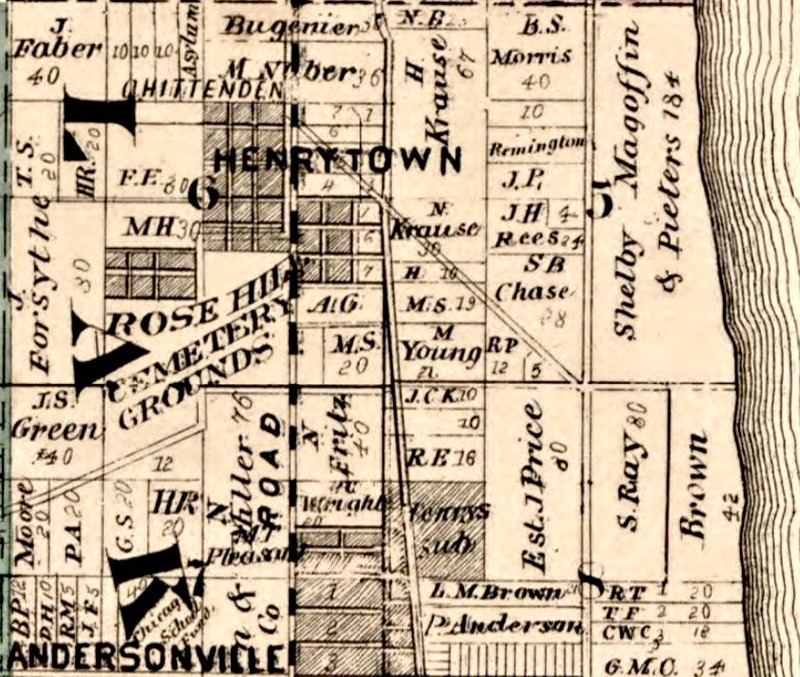 Civil townships are distinct from survey townships, but in states that have both, the boundaries often coincide with one another. 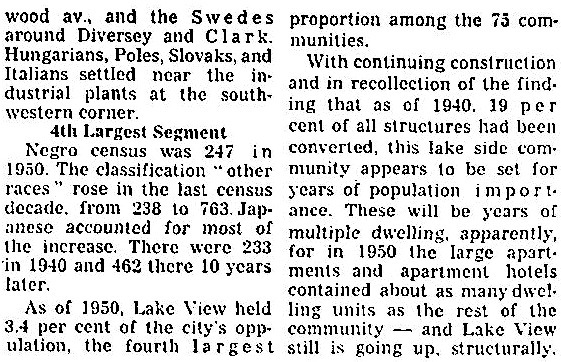 The U.S. Census Bureau classifies civil townships (called "towns" in New England, New York and Wisconsin) as minor civil divisions. When reading articles in my blog posts notice that 'town' refers to the word 'township' by the newspaper. 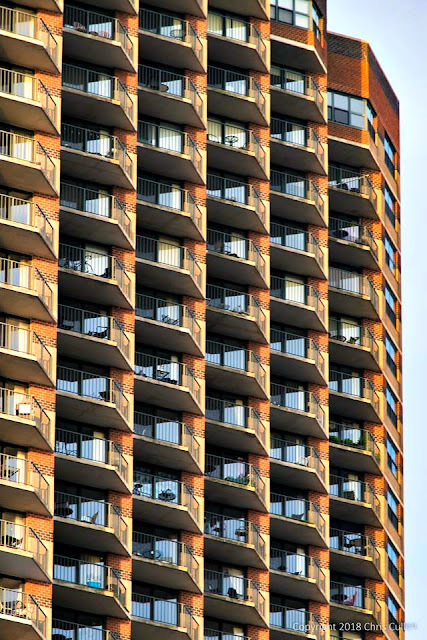 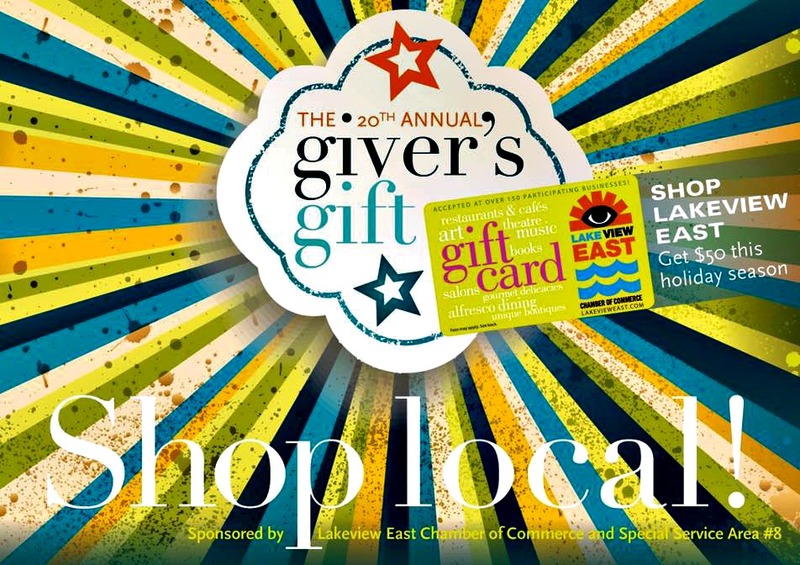 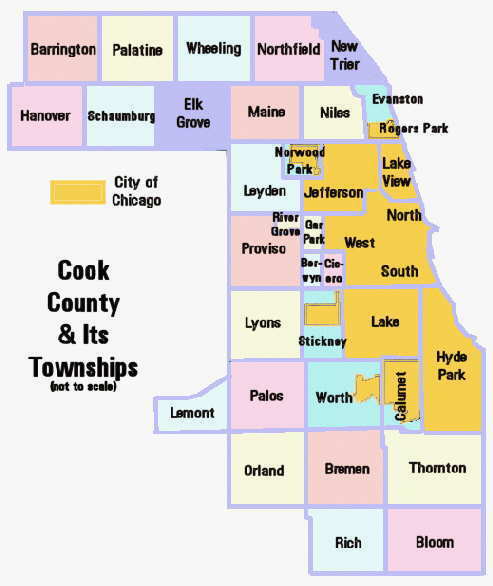 A township governmental functions are generally attended to by an elected governing board (the name varies from state to state) and a clerk or trustee. Township officers frequently include the justice of the peace, road commissioner, assessor, constable, and surveyor of land. 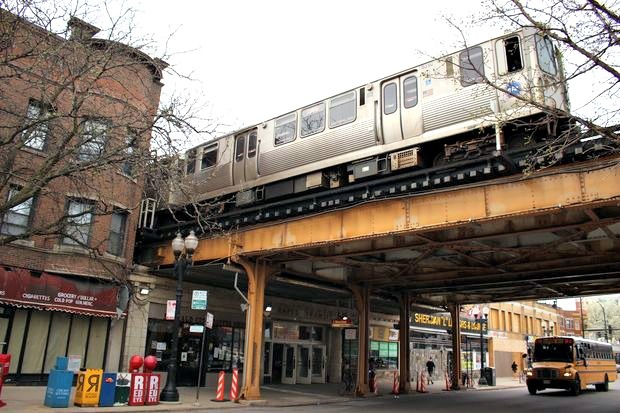 3) maintenance of all roads and bridges outside federal, state, and other local jurisdiction such as a city in Illinois that has 'home rule' status. 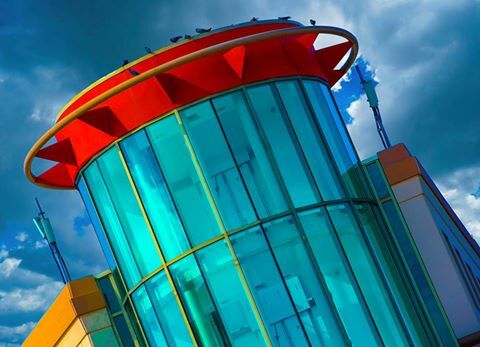 Beyond the three mandated services township government provides other vital services. 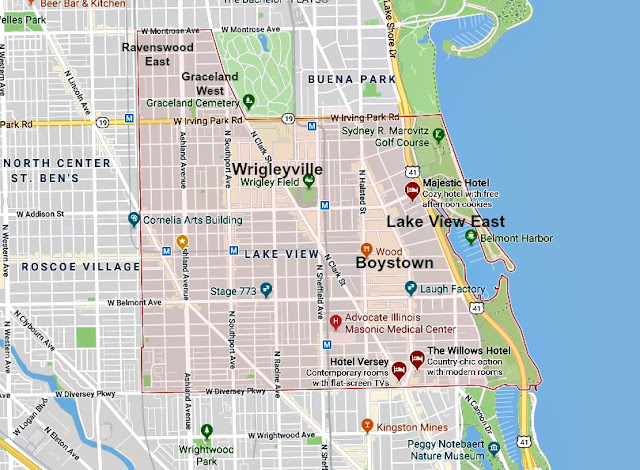 This may include senior citizens programs, youth programs, assistance to the disabled, parks and recreational facilities, health services, and cemetery maintenance. 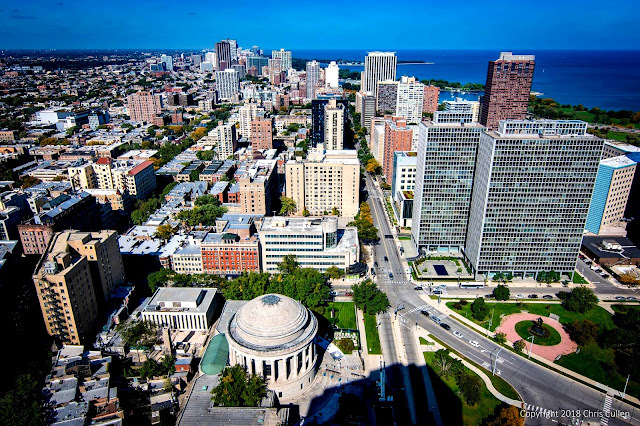 Township government can serve its population from the cradle to the grave within the direct authority of their State government. In the 20th century many townships also added a township administrator or supervisor to their governing board. 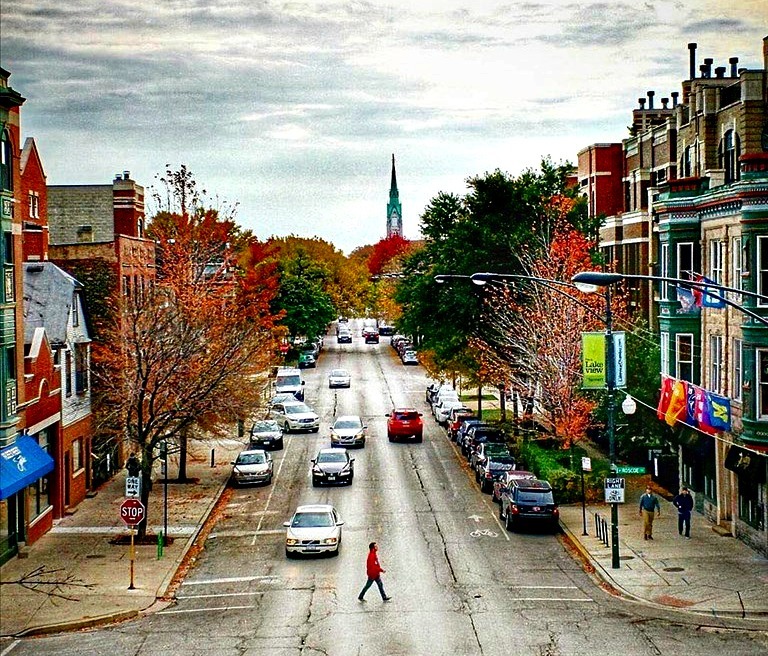 Today, the township governments maintain over 71k miles of roads in Illinois-53% of all roadways 2010. 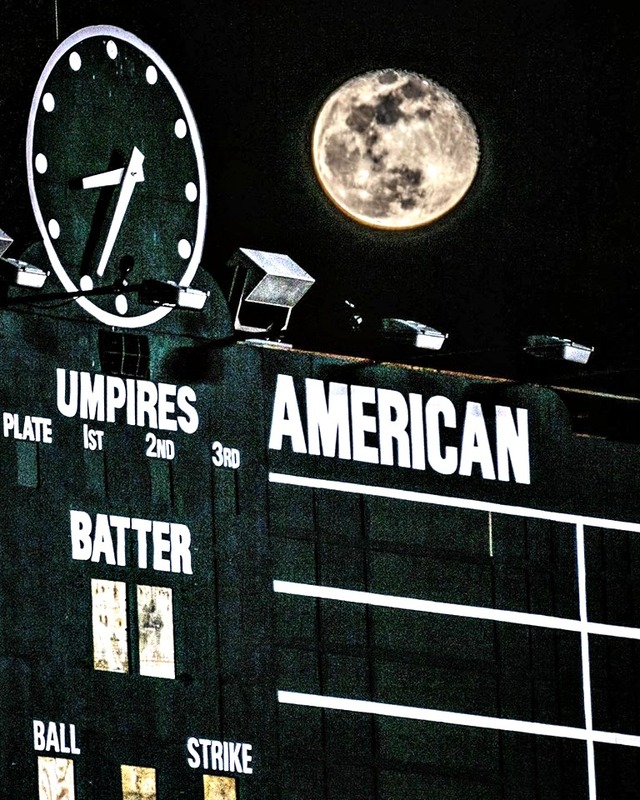 "Nothing happens in a vacuum." 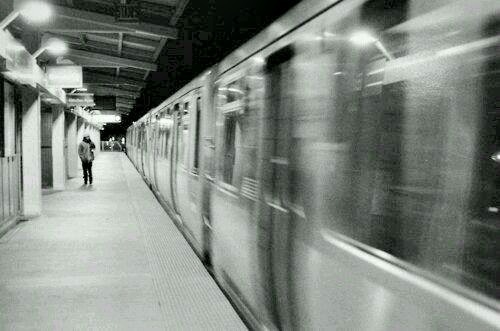 – meaning nothing happens in and of itself. It's always a sequential process of events that bring things to its' present situation. 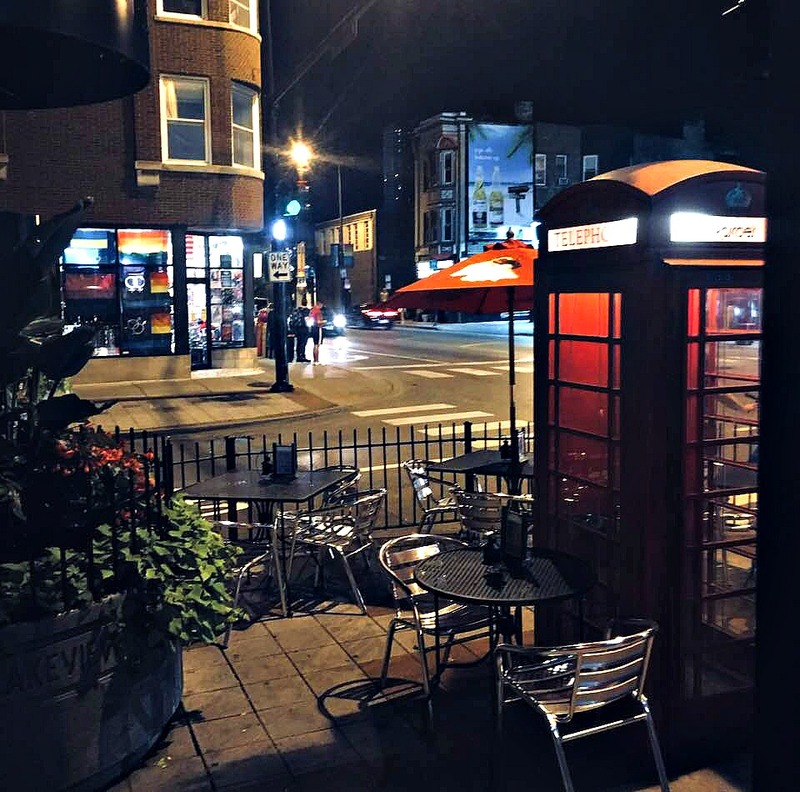 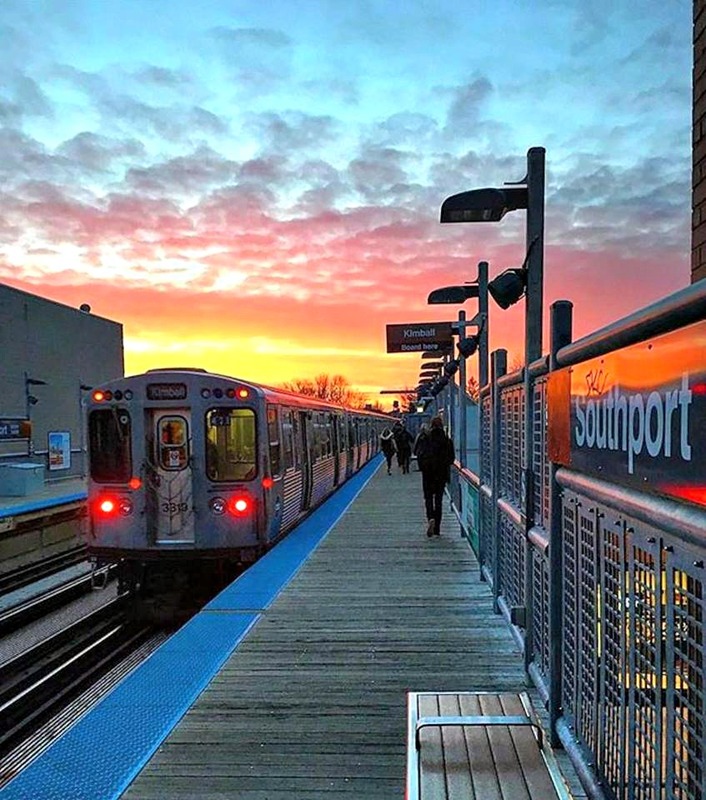 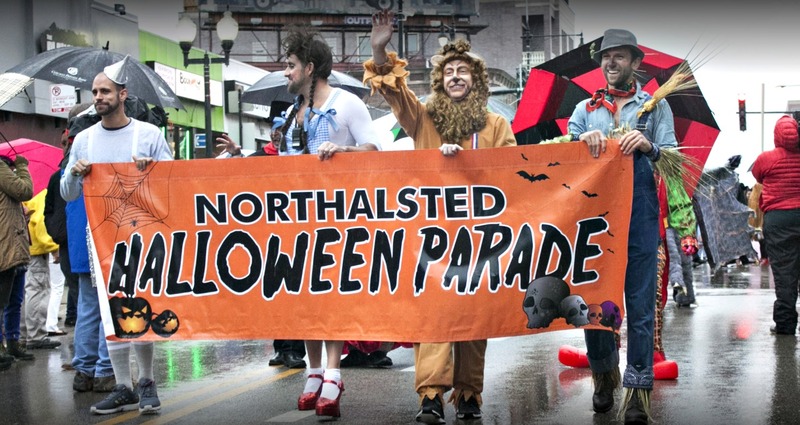 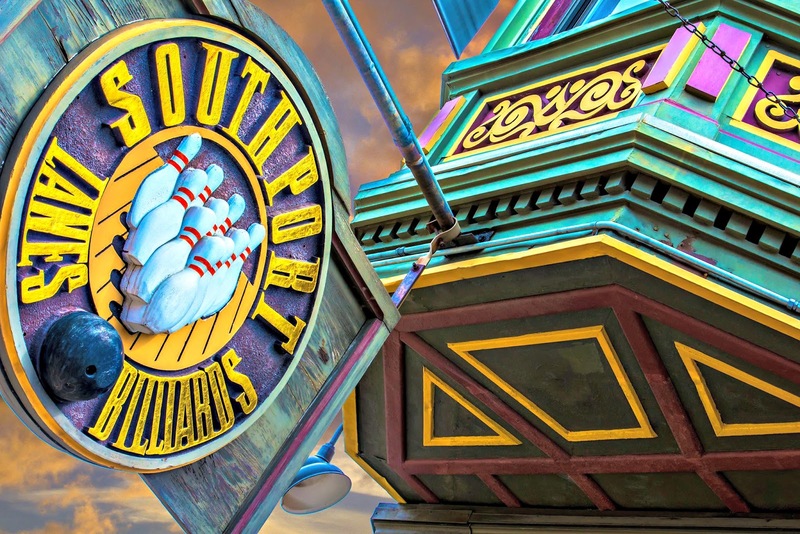 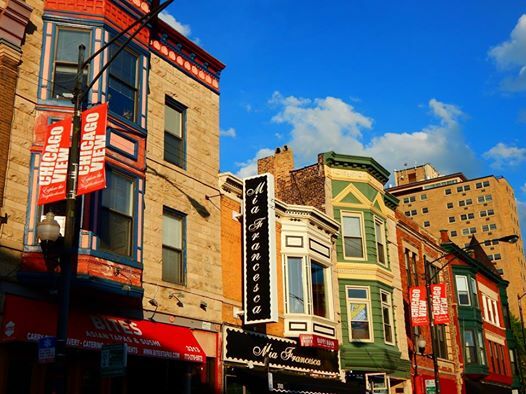 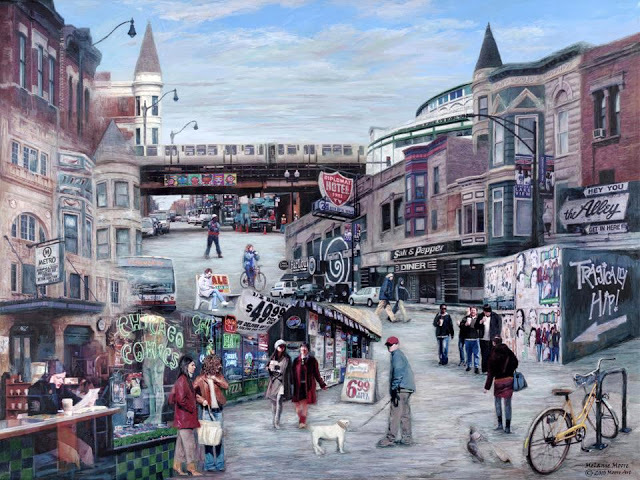 The events in the City of Chicago (as well as in Europe) during the mid to late 19th century allowed the townships north of Chicago to create an identity of its' own. 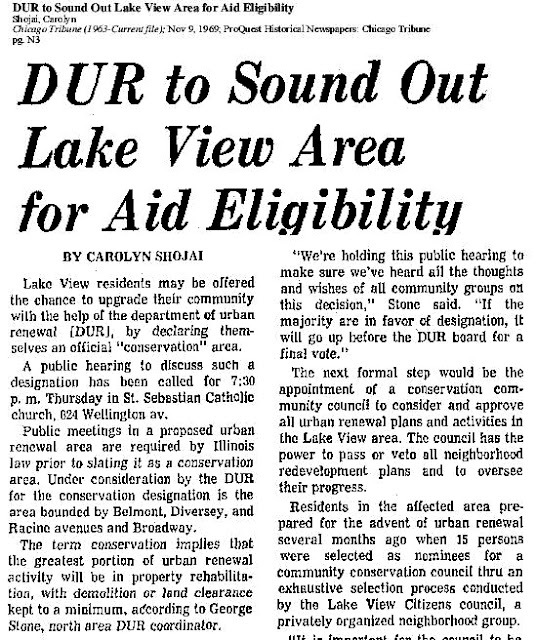 The Township of Lake View and the authority before it called Ridgeville Township was of no exception. 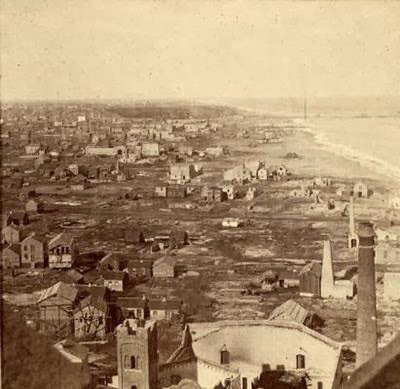 Emigration from Europe due to the European revolutions of 1848 and unending famines and pandemics along with the aftermath chronic health issues in Chicago particularly the cholera outbreak of 1854. 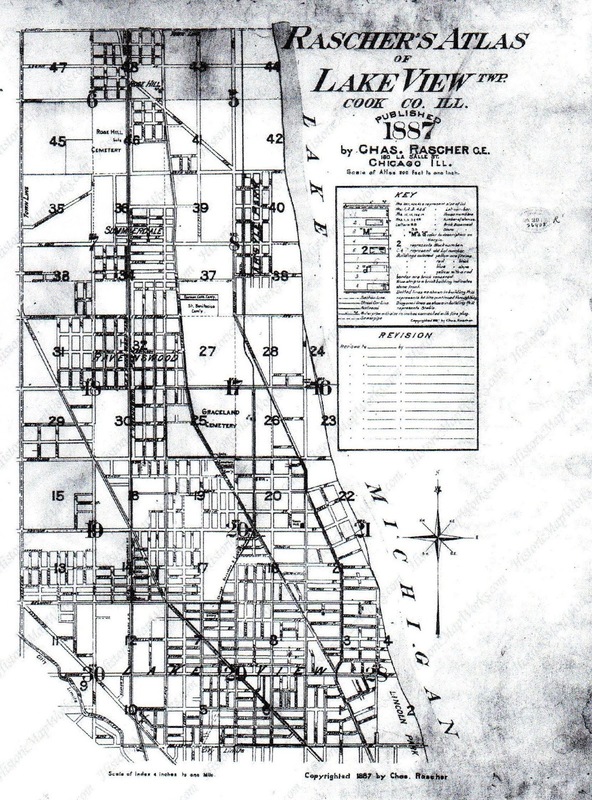 It's my opinion that two sequential processes of events occurred in the 19th century in the Chicago area that assisted in the advanced development of Lake View Township. 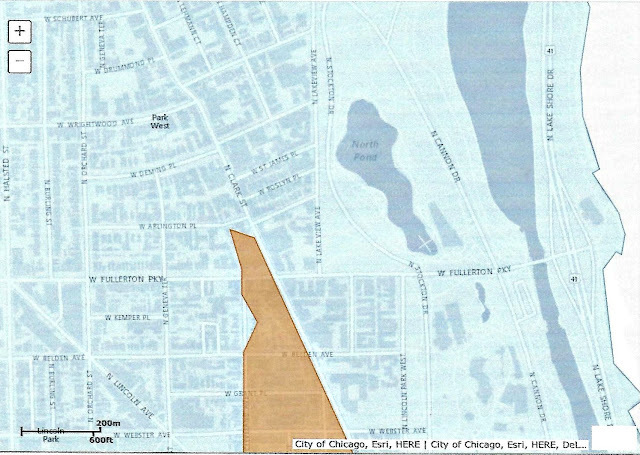 The first was the ill planned location of the first north-side cemetery called Chicago Cemetery and The Great Chicago Fire of 1871. 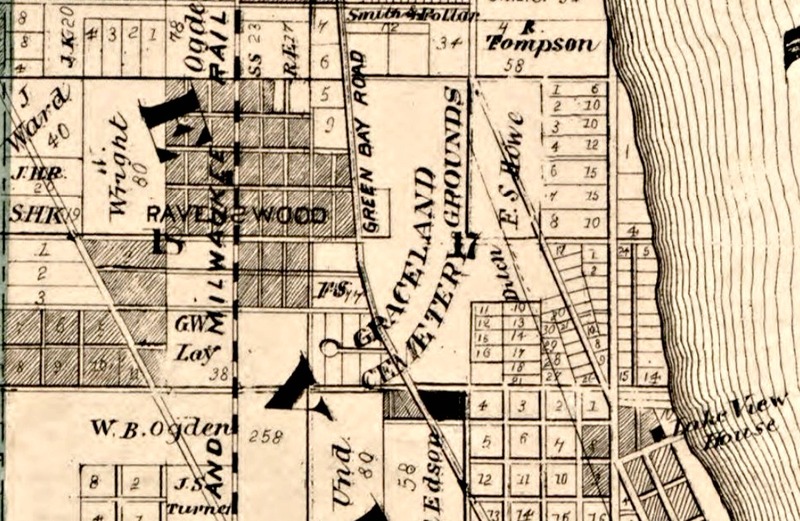 The failed north-side cemetery once located along the lakefront was due to the human-health issues that were to be discovered during that time period that forced the closure and for development plans for locations that were of 'higher ground' along the old Native American trail along Green Bay Road (Clark Street). 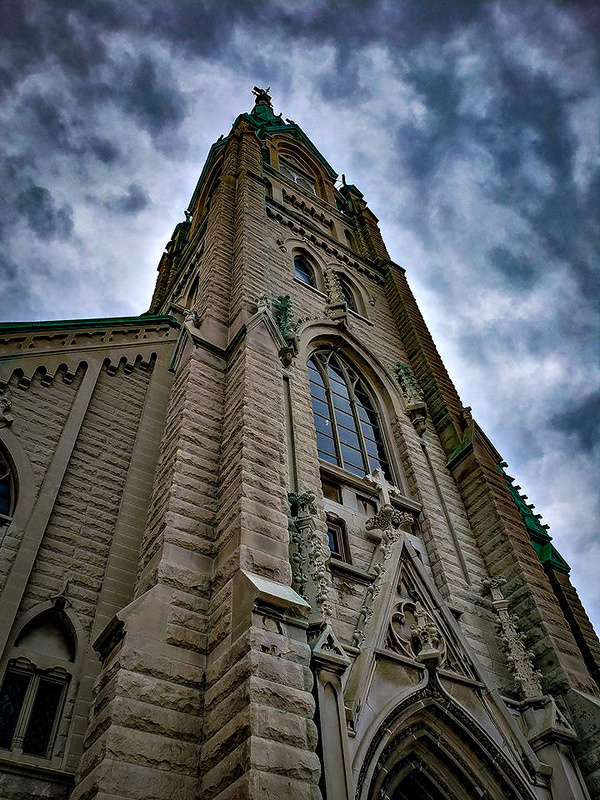 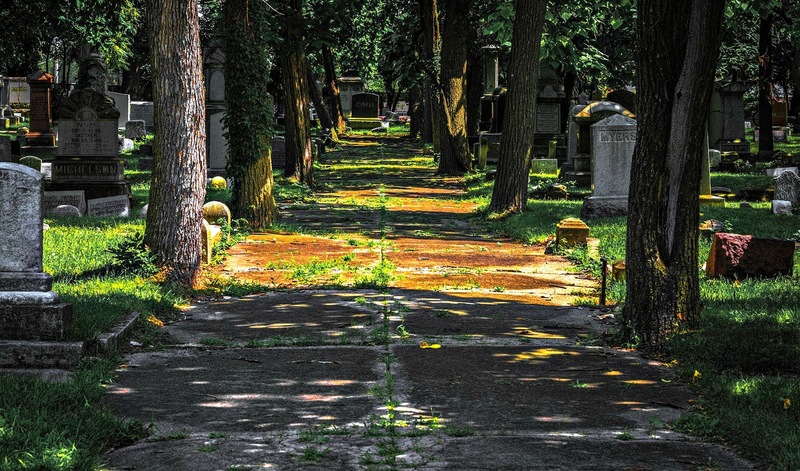 Chicago residents traveled to these several cemeteries prior and after the Great Chicago Fire on Sundays to visit their either relocated deceased relatives or new one. 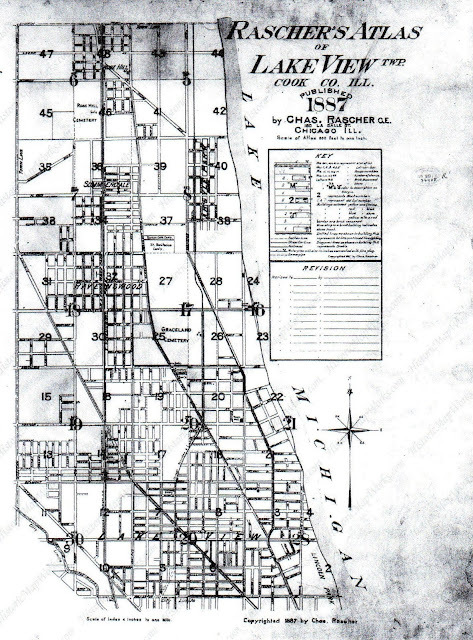 Their would stay in roadhouses along the Green Bay route and discovered a new land northern of limits of Chicago - North Avenue. 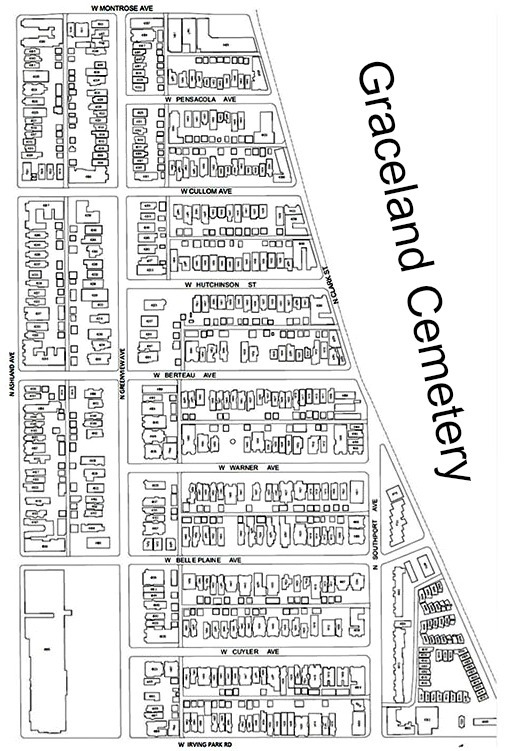 Visit my other blog post about the township cemeteries of Graceland, "Jewish Graceland", Boniface, Wunder, and RoseHill. 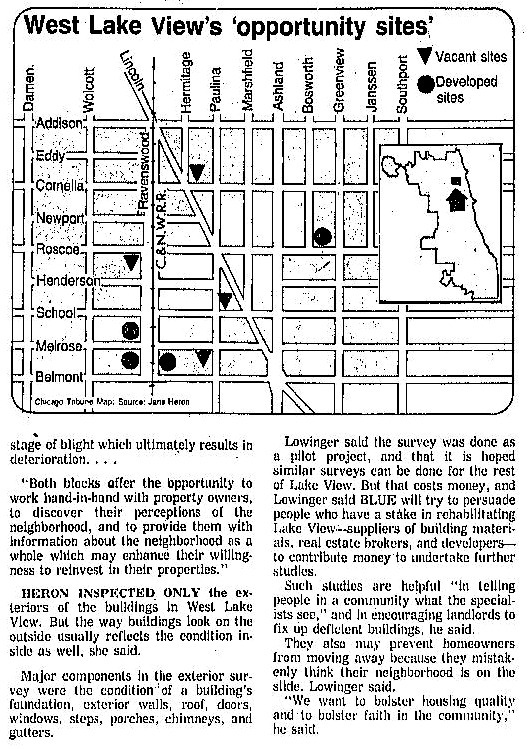 The borders of Township/then City of Lake View were north of Fullerton Avenue to Devon; Western Avenue except along the Chicago River from Wrightwood to Fullerton and then to the then existing lakefront. That chunk of land west of the Chicago River was annex to Chicago in the 1856 - one year before Lake View became a township - a land grab maybe?? 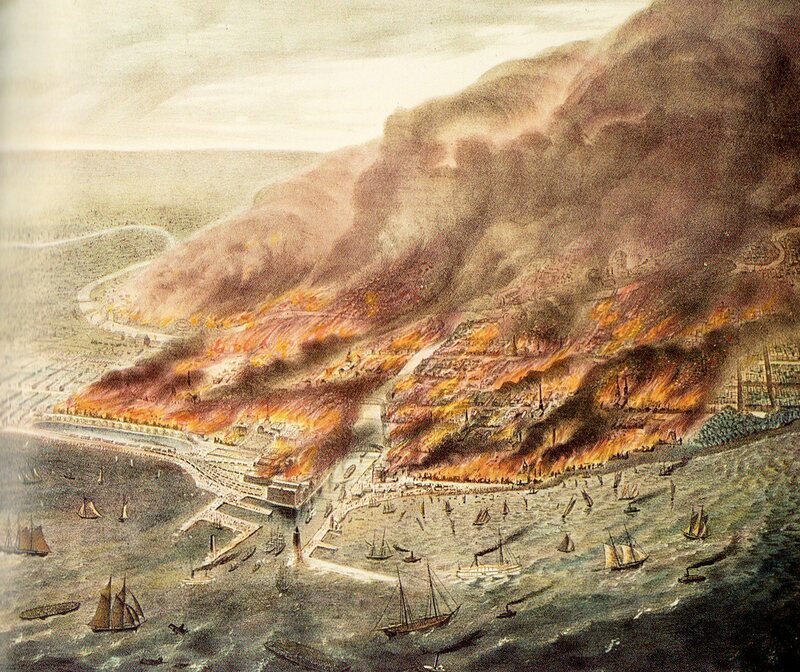 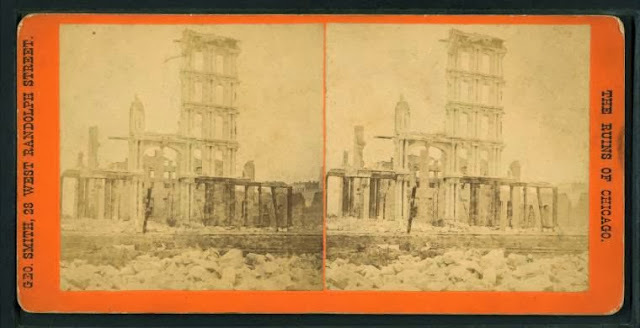 The Great Chicago Fire aftermath created a climate of growth in the existing townships of Cook County outside the City of Chicago - for it allowed houses to be built of just wood and limestone and cemeteries to be located outside the Chicago in the Township of Lake View. 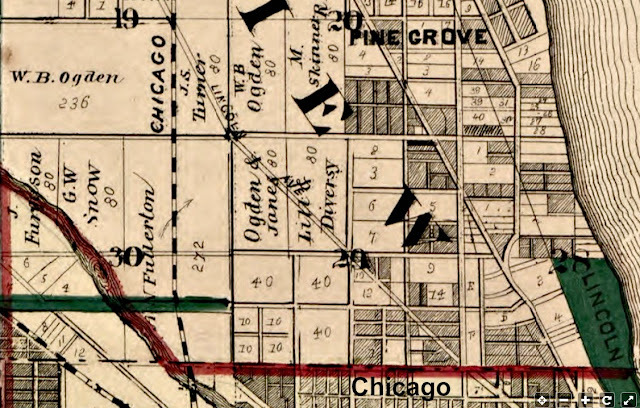 According to an interactive map from Chicago Fire Department the fire crossed into the township north of Fullerton Avenue along Clark Street (Green Bay Road) west a block but no further north then present day Arlington Place. John A. Huck was saved and the fire was stopped by a team of neighbors and police (paid $1000). 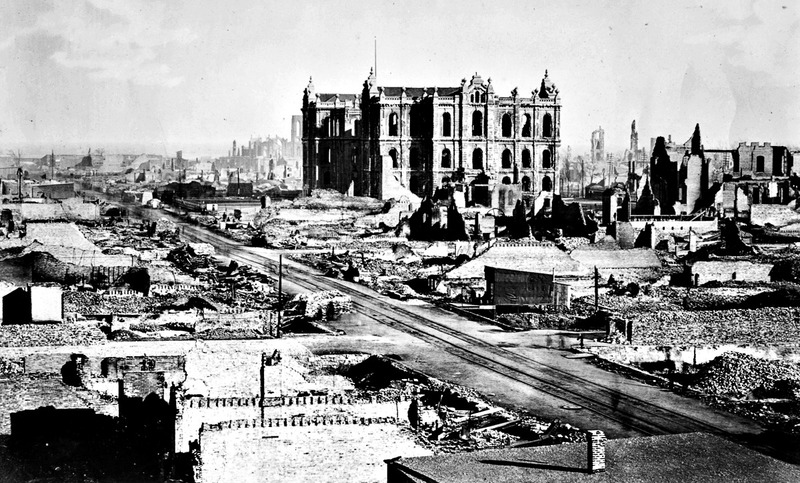 Sparse surroundings and better climate were other factors that ended the fire from traveling northward. 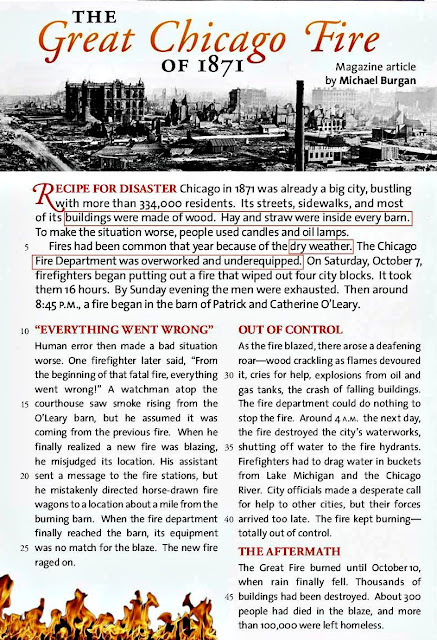 Many refugees of the fire were given shelter north of Fullerton Avenue according to a photo text from the Ravenswood-Lakeview Collection. 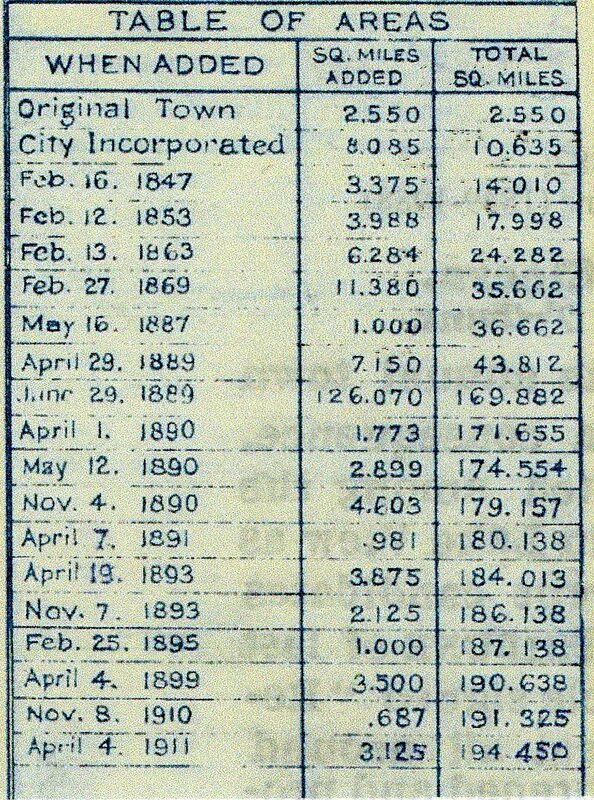 One thousand dollars in 1871 would be worth over 19 thousand in 2014. 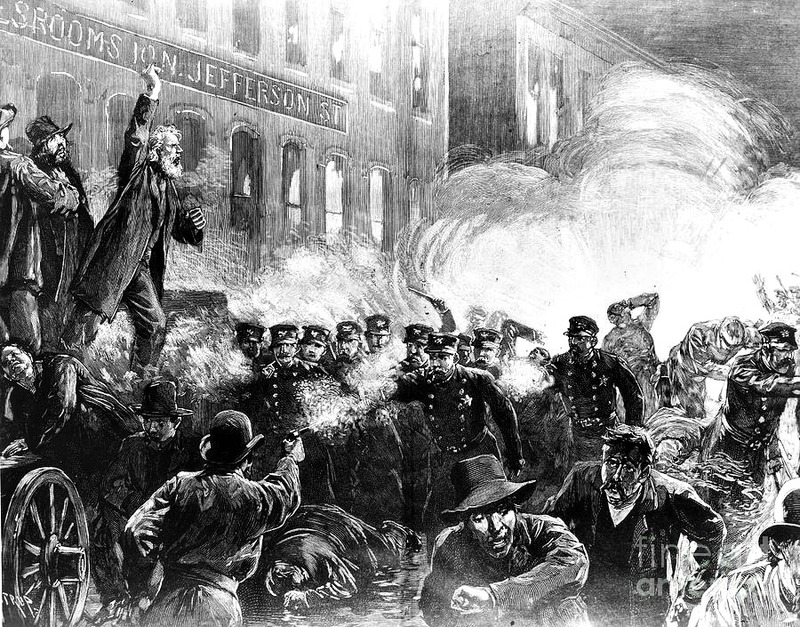 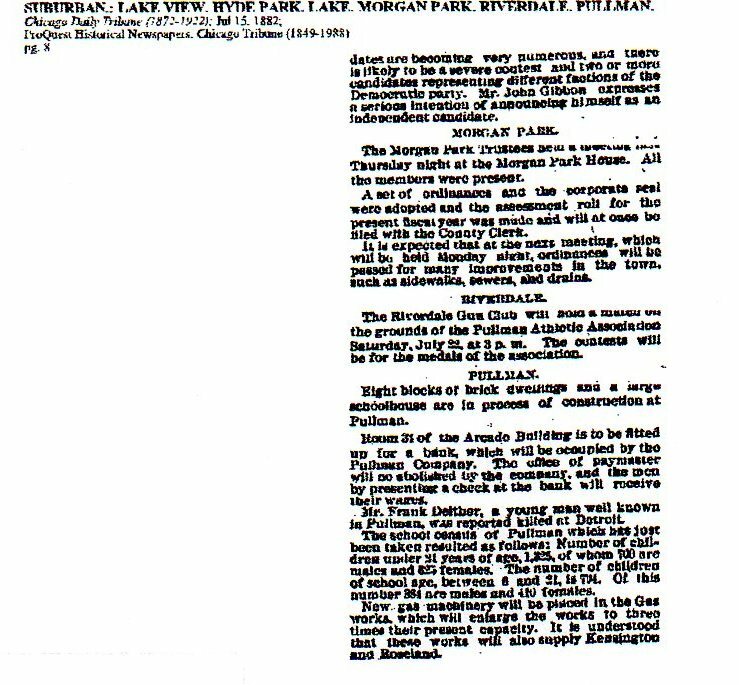 Even events like the Haymarket Riot would cause ripple effects along our lakefront with the construction of the roadway along the lakefront that would allow federal troops from Fort Sheridan in Highwood, Illinois to travel to downtown Chicago to end labor unrest. 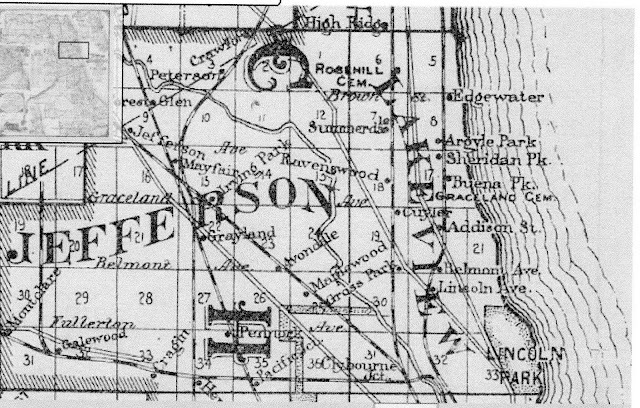 This legend is from another annexation map (1911) that highlights the increase of population per annexation of land mass. The largest land increase was in June 1889. 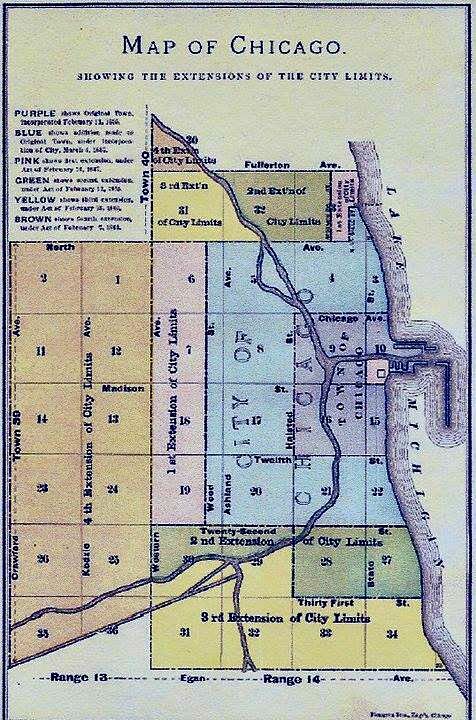 This University of Chicago digital map (zoomed) shows the plans for the northern segment of Lincoln Park, the park, that had dual representation by the Township of Lake View and City of Chicago as of 1869. The southern border of the township was Fullerton Avenue, at the time. 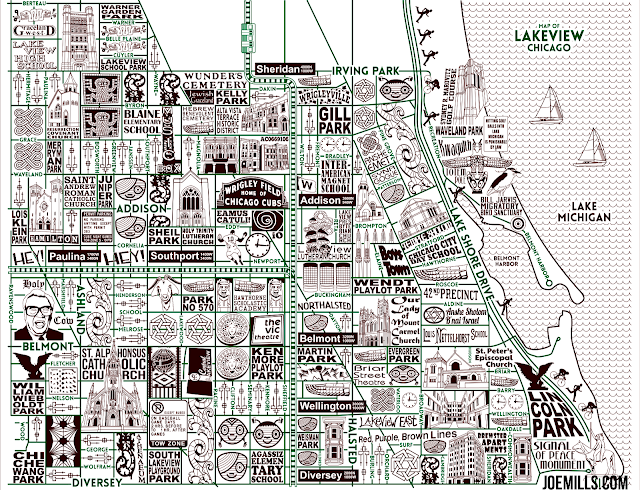 Within this map the road along the lakefront was to be referred to as Lake Shore Drive - the original one. 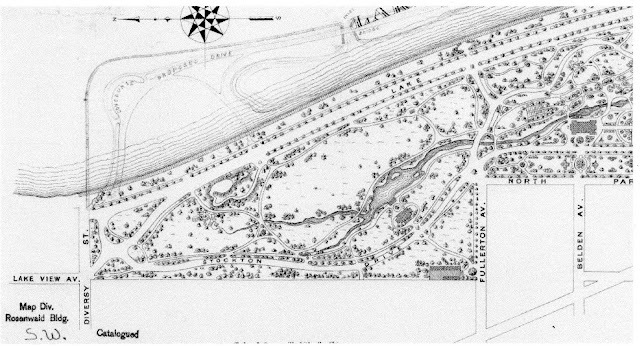 The Lincoln Park Board of Commissioners, the governing entity for it, planned to extend the park space beyond Fullerton Avenue - landfill into the lake due the expense nature of purchasing private property. 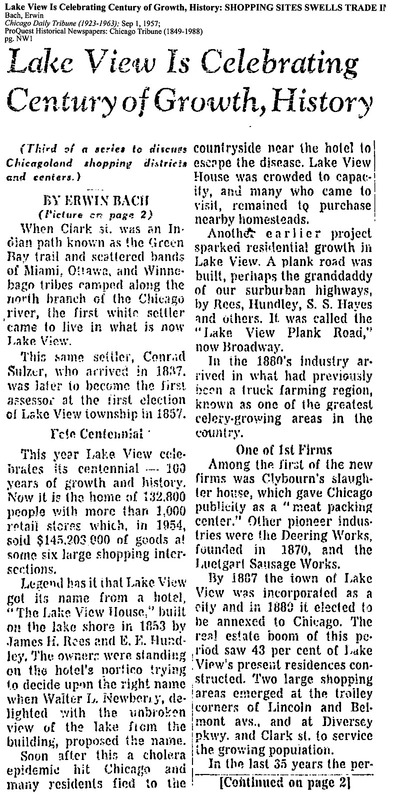 Lake View Township spanned an estimated 125 square miles and was divided into seven districts. Each district population had to 'power of petition' within their own districts to the township council on issues of concern particularly liquor licenses. The borders of Lake View Township ranged from Devon Avenue to the north, Fullerton Avenue to the south, Western Avenue to the west, and the lake to the east. 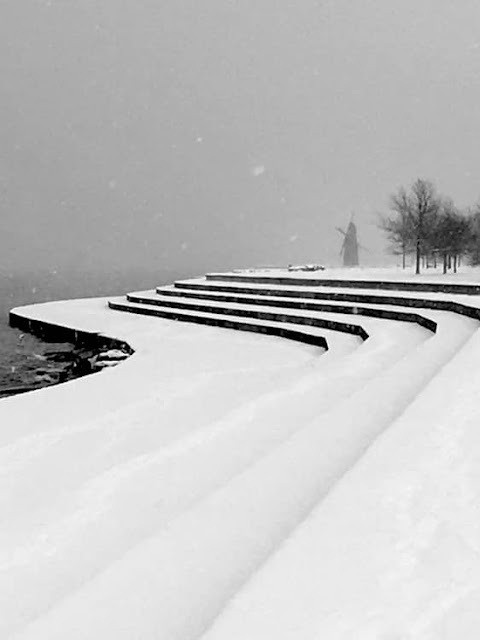 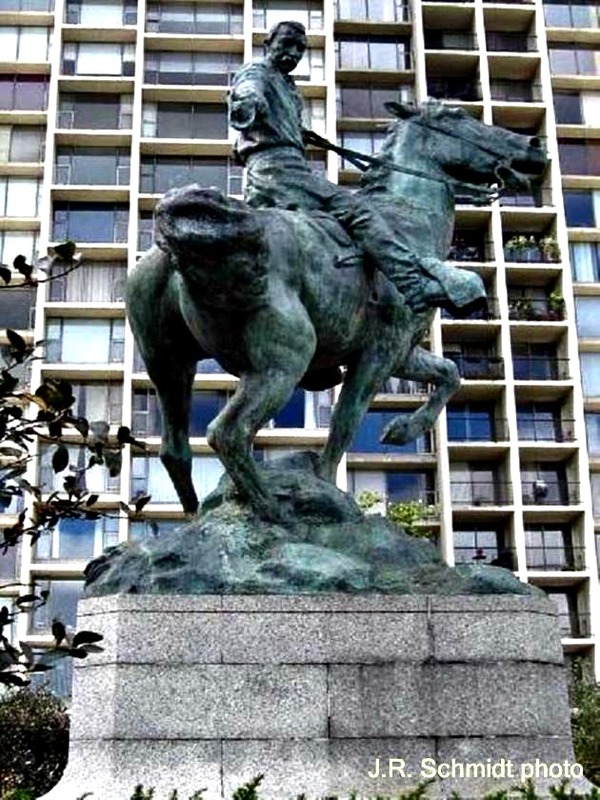 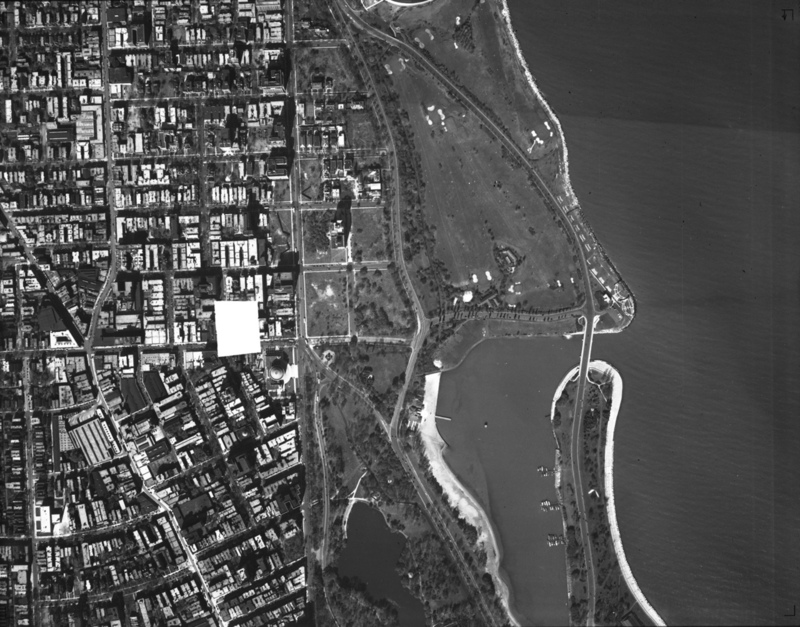 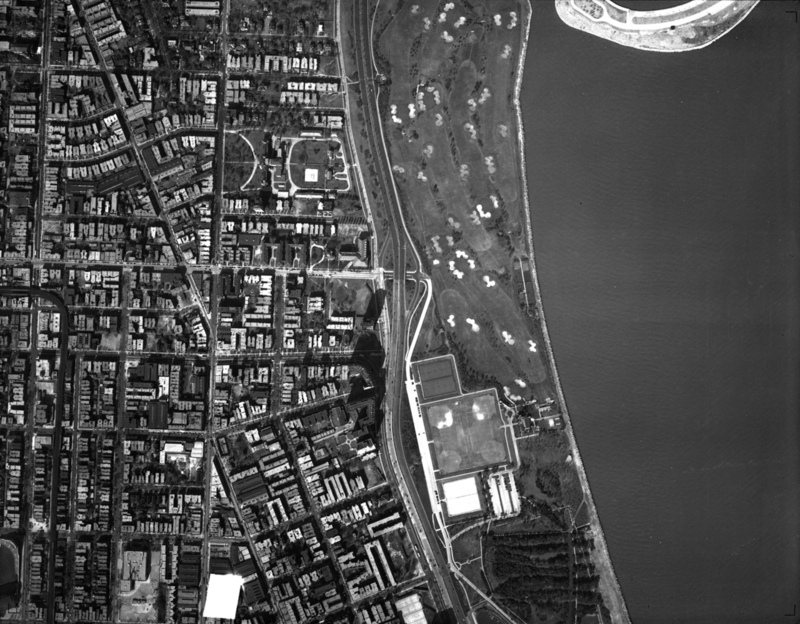 Due to the expansion of the Lincoln Park (the park) more land was added by landfill to the entire lakefront beginning in the mid 19th century to the mid 20th century. 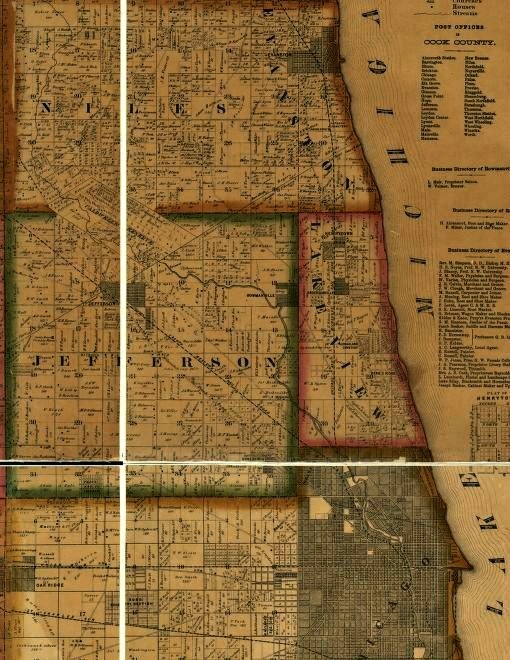 Lake View Township (p. 263) was officially established by the State of Illinois by 1857 but not formally organized as a functional governmental entity until 1865. 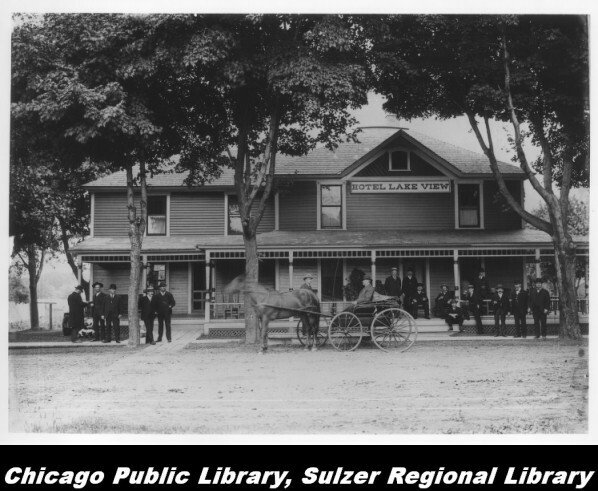 The City of Lake View (1887-89) chartered by the State of Illinois in 1887 & was divided into seven wards (former township districts). 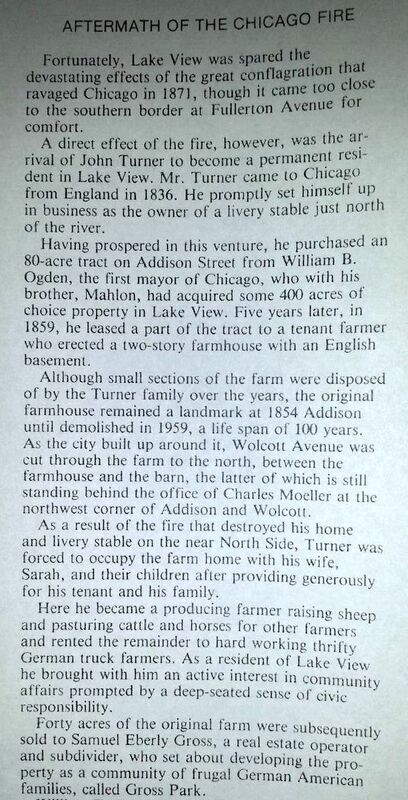 William Boldenweck was the mayor for two years prior to annexation by the City of Chicago in 1889. 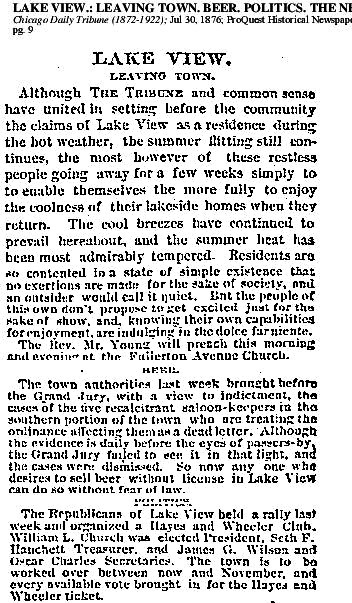 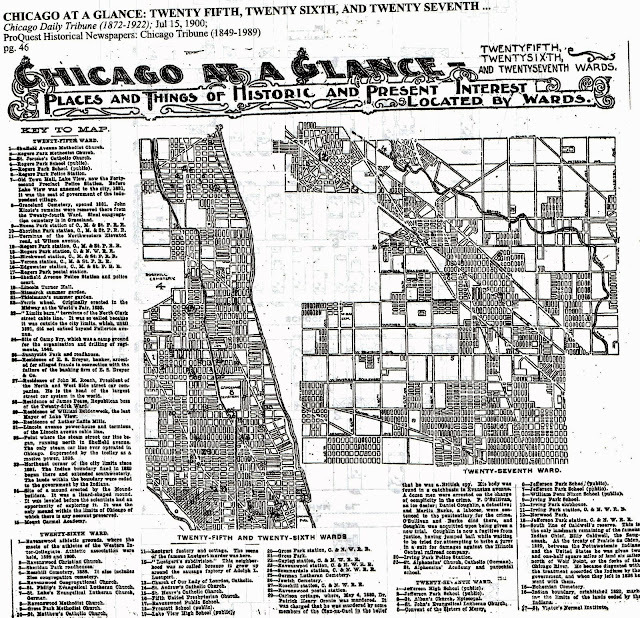 This 1882 article below tells a tale of areas around the City of Chicago that were general known 'suburbs' surrounding Chicago. 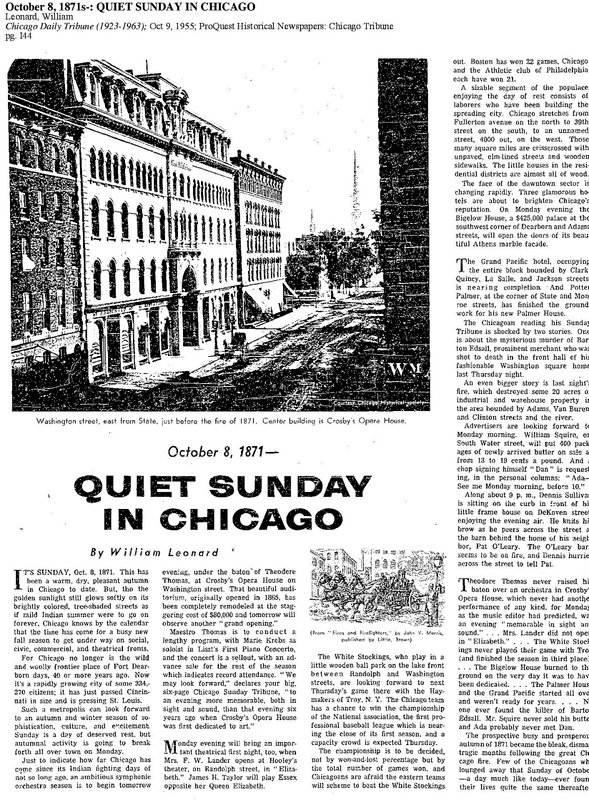 Also, articles I found from the Chicago Public Library newspaper section - Chicago Daily News aka Chicago Tribune would refer to 'town' as 'township'. 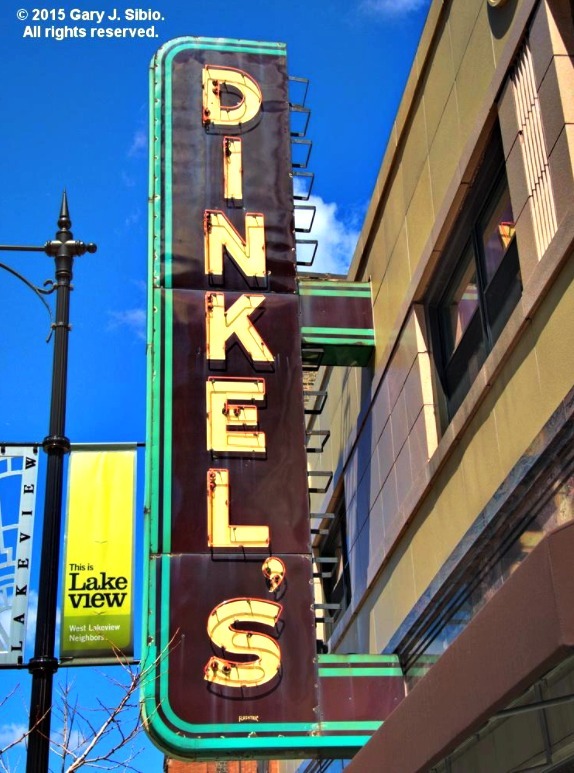 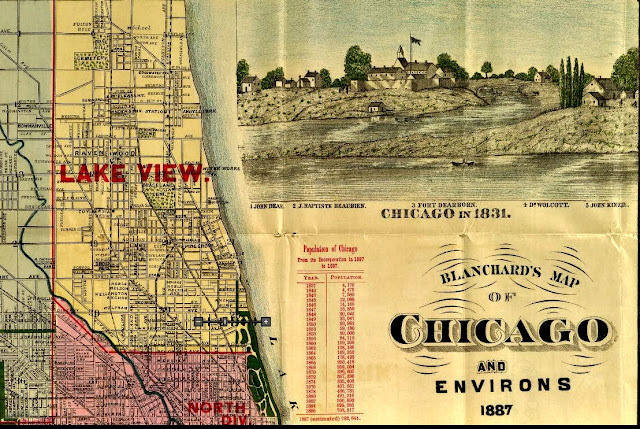 On November 5, 1889 the City of Lake View formerly known before 1887 the Township of Lake View was annexed by the City of Chicago after a June 'referendum' election held by the citizens of the city. 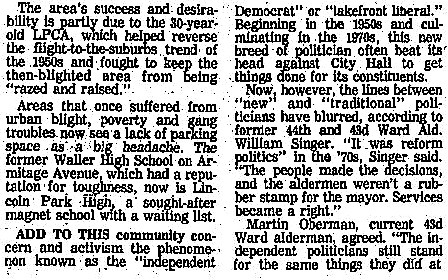 The special election pitted the citizens who demanded 'Chicago-like' services, particularly those voters who demanded clean drinking water vs businesses owners, particular salon-owners, who did not want City of Chicago regulations and increases in taxation. 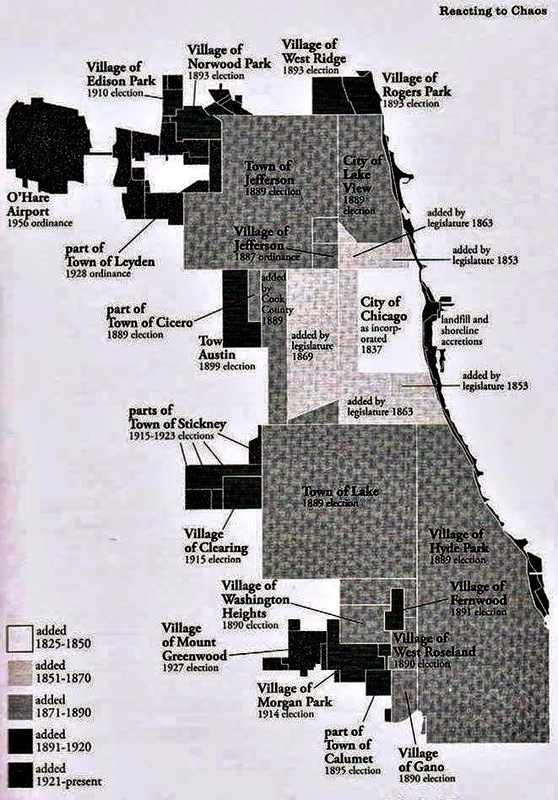 That same year the City of Chicago doubled in geographical size annexing southside townships, as well. The following townships were annexed by the City of Chicago: On the north-side was Lake View and Jefferson townships and on the south-side: Hyde Park and Lake townships. This 1893 UC collection map still shows the old townships of Lake View and Jefferson that were annex by the City of Chicago in 1889. 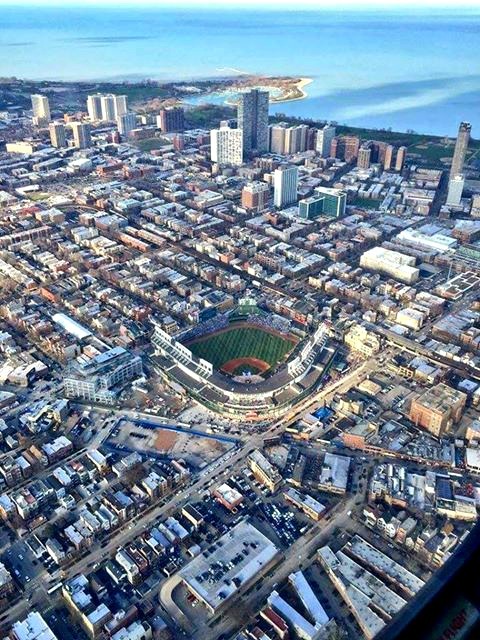 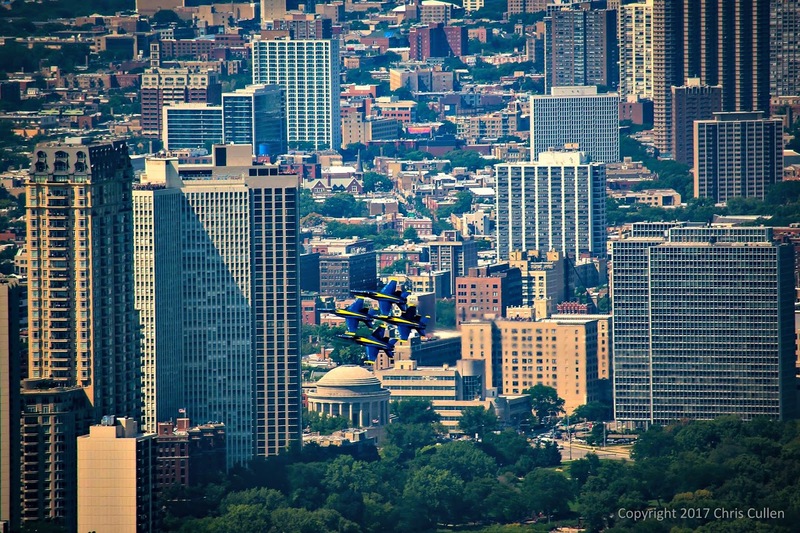 Complete administrative integration to the City of Chicago would take years to complete. 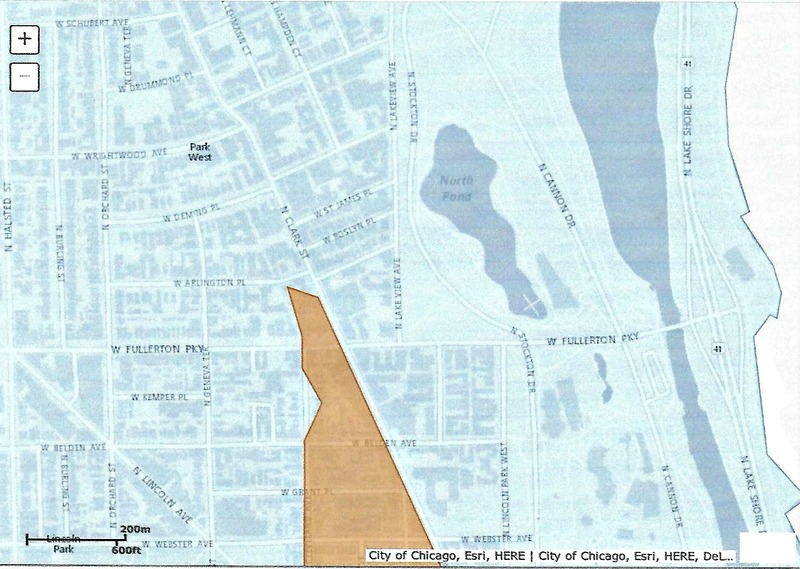 Example, the officials in the new District of Lake View still controlled the water supply from the lakefront. The Township of Lake View who originally built a crib and pumping station for political reasons refused to connect their water supply to the former Township of Jefferson until the City of Chicago step in to resolve it. 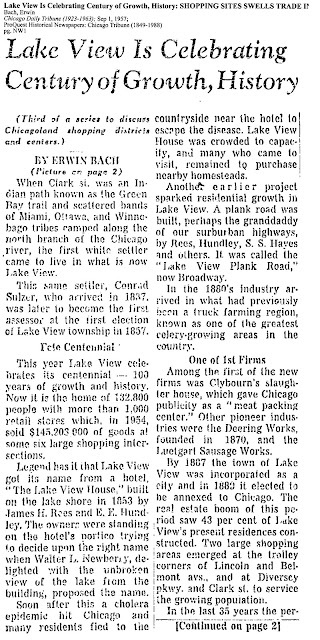 This 1900 Chicago Daily Tribune article above highlights the 'places of interest' at the time within the new District of Lake View - former township/city. 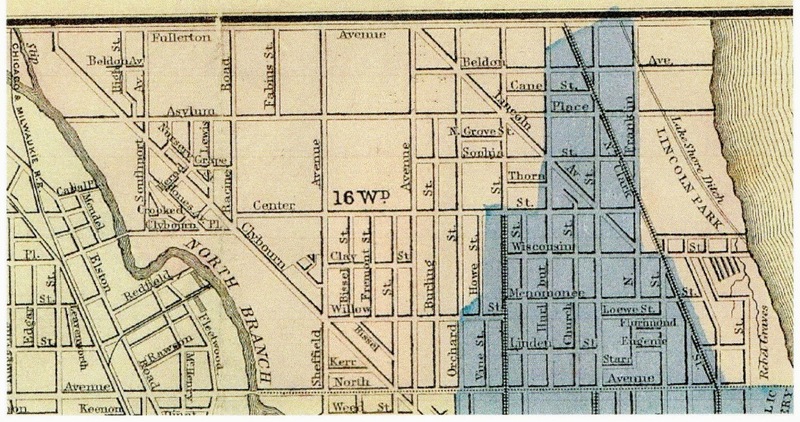 When City of Lake View was annexed the area was divided into mostly two city wards. 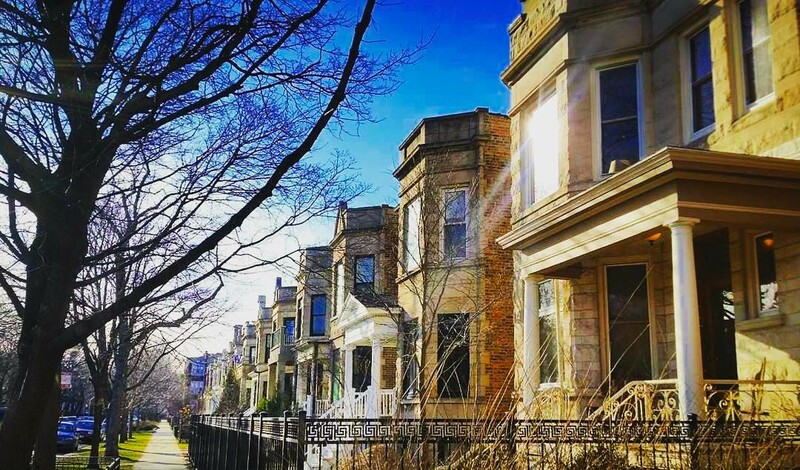 What do we call this New Community? 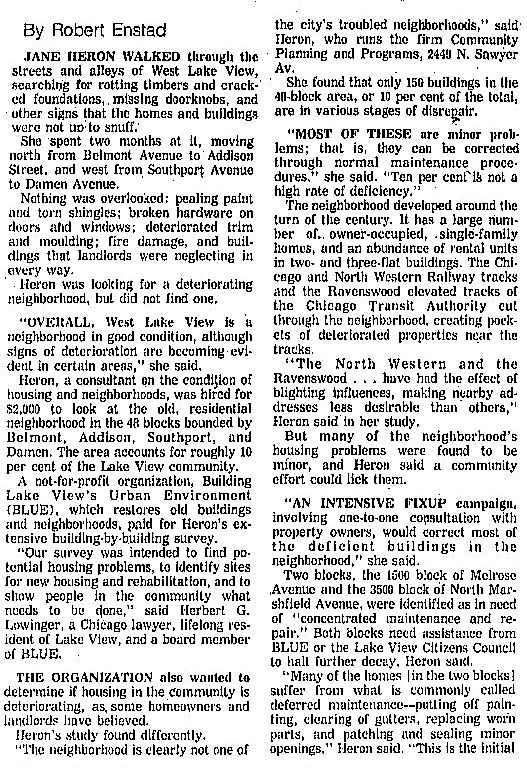 'A community area is one of 77 pre-defined Chicago areas with boundaries that have remained, for the most part, stable since the 1920's. 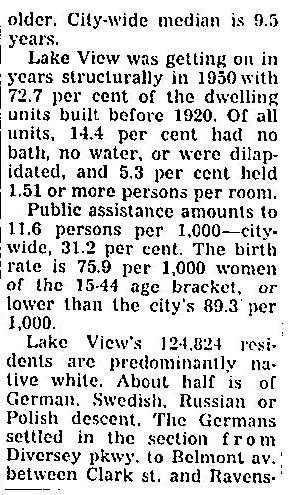 Community areas were created so the census bureau and social scientists could track statistics consistently in defined areas over time. 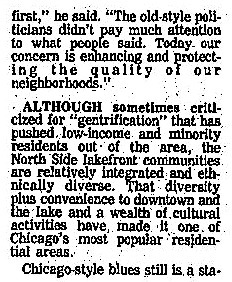 In other words, 'neighborhoods' may come and go within a 'community area' but community areas will remain the same. 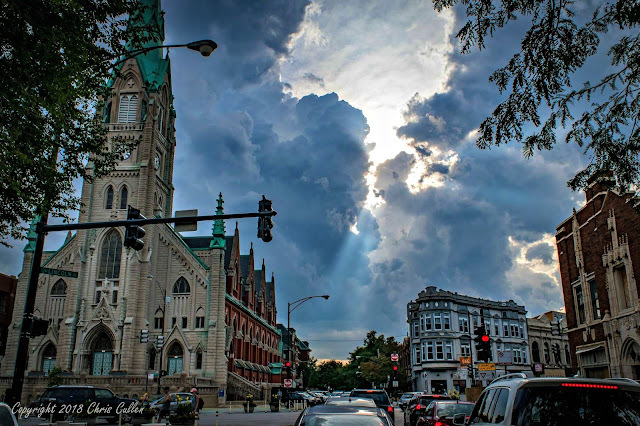 with more other views from John Picken and a link from YouTube, with another link from YouTube, and finally Flickr. 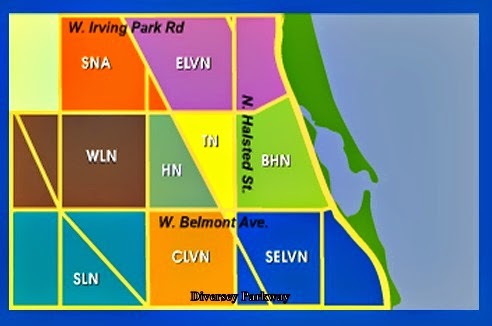 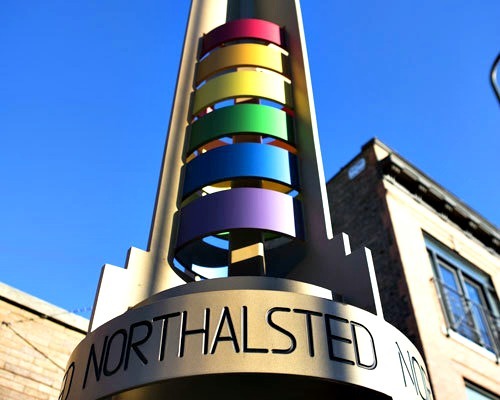 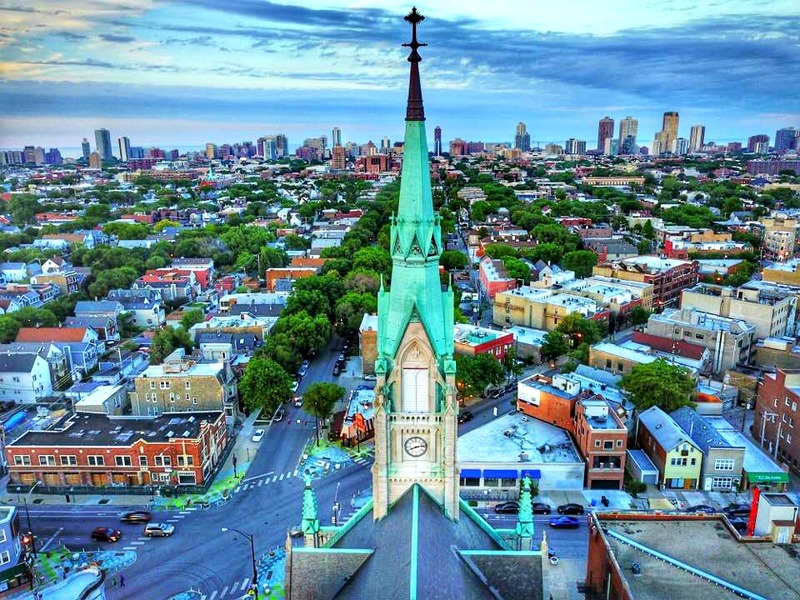 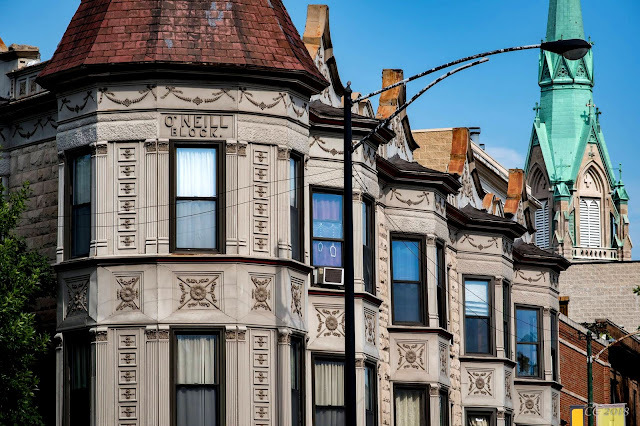 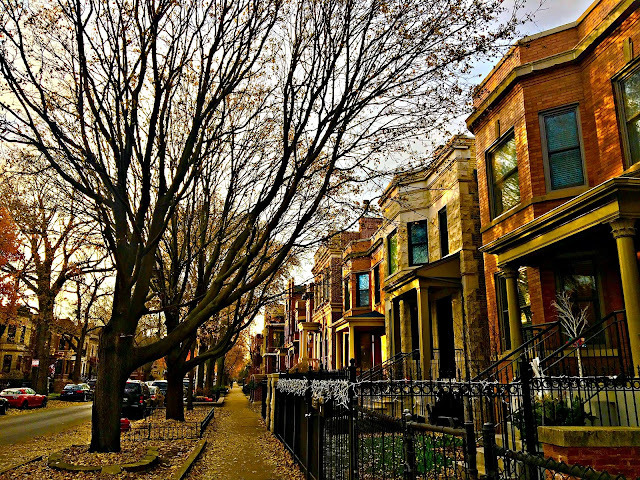 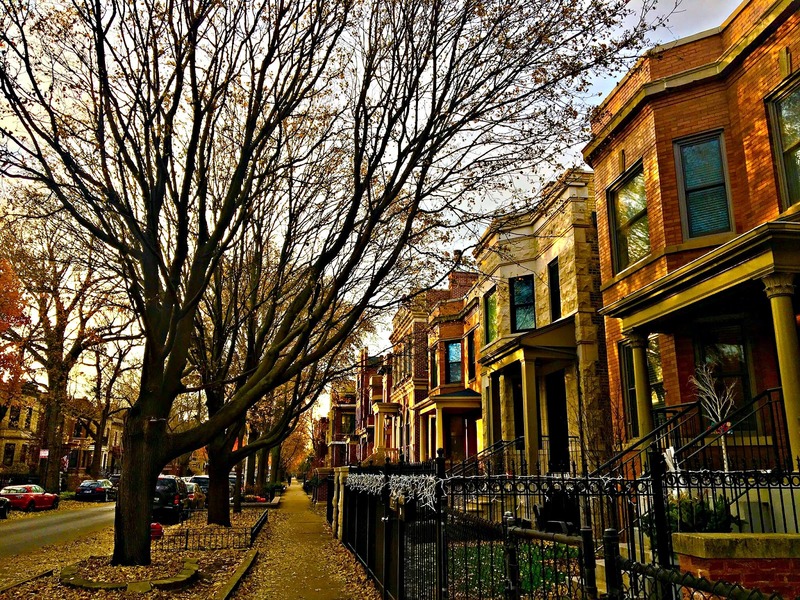 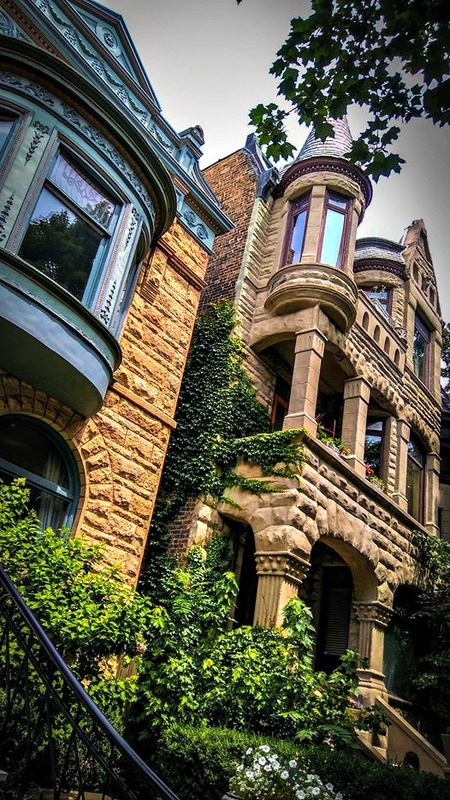 These separate neighborhoods span from East Ravenswood Avenue from Clark Street west - Montrose to Irving Park Road. 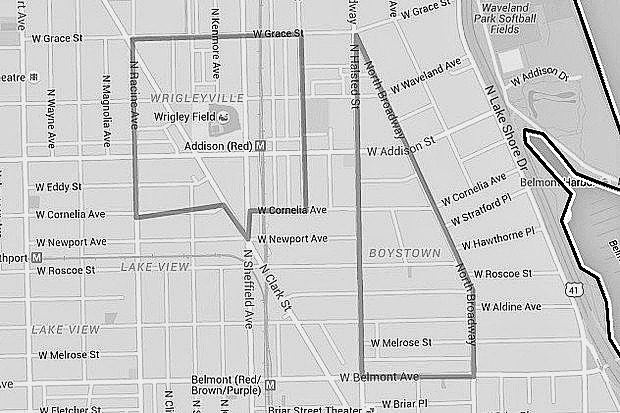 The border of the communities is Ashland Avenue according to Yo Chicago. For more information about Graceland West tap into their neighborhood association site. South-east Ravenswood is part of the original borders of the old Lake View Township community of Ravenswood. The original borders of old Ravenswood was Clark Street to Western and then Lawrence to Irving Park Road. 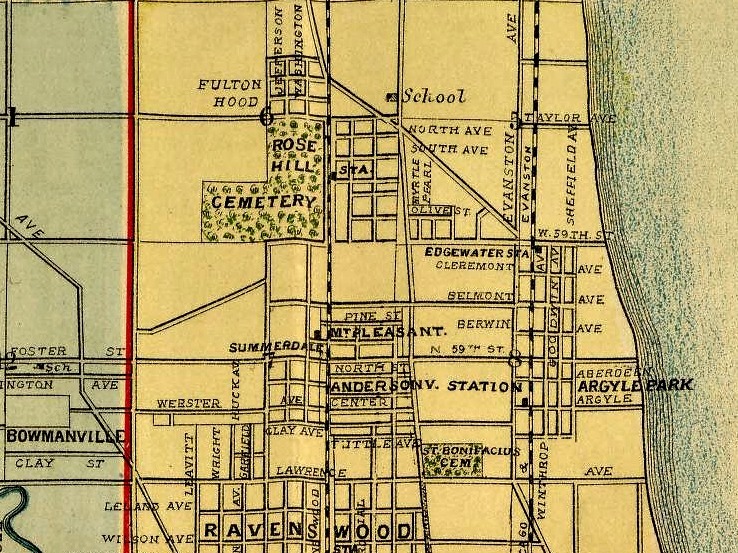 After the establishment of official 'community areas' or neighborhoods by 1930 old Ravenswood was divided between the neighborhoods of Lake View, North Central, Uptown, and Lincoln Square. 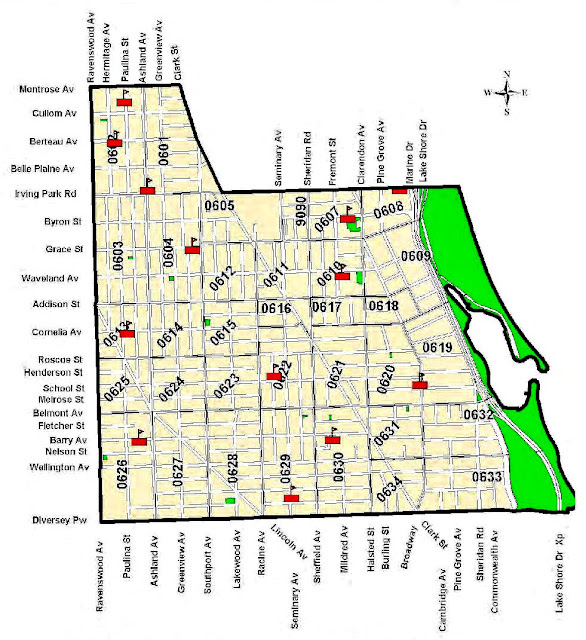 As of 2016 it would seem the South-east Ravenswood community does seem to have an association but maybe block clubs. 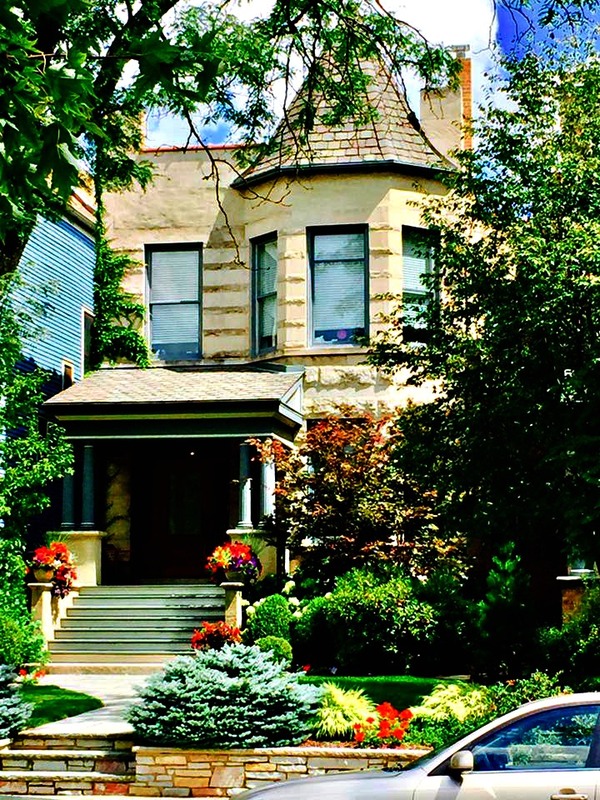 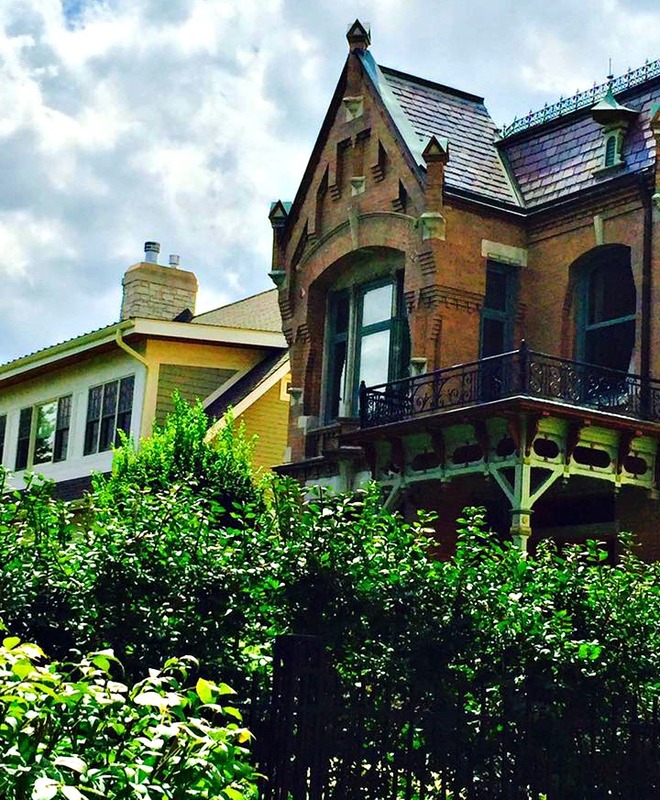 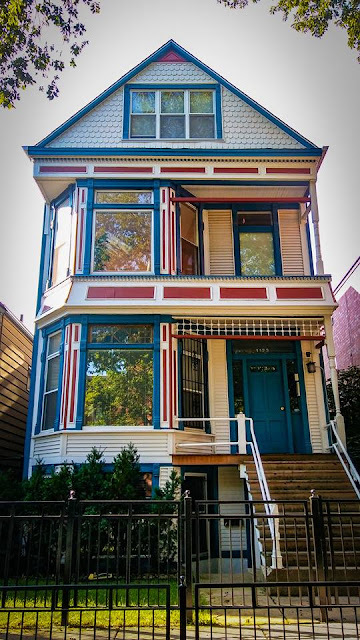 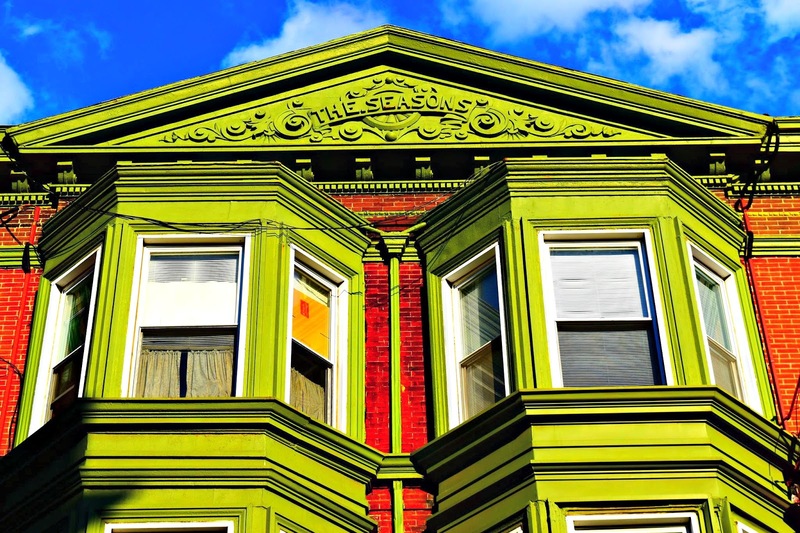 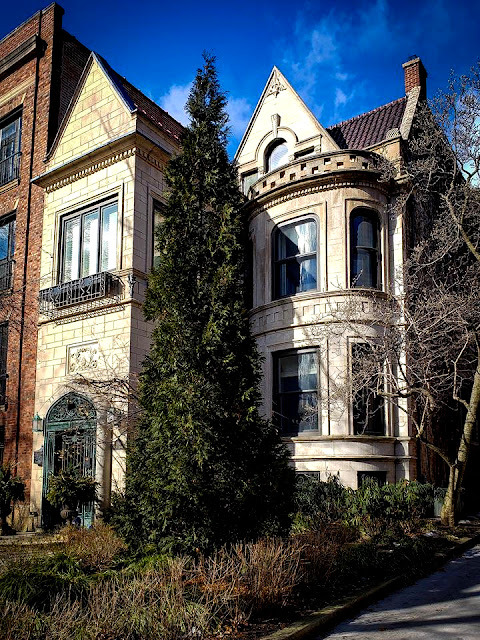 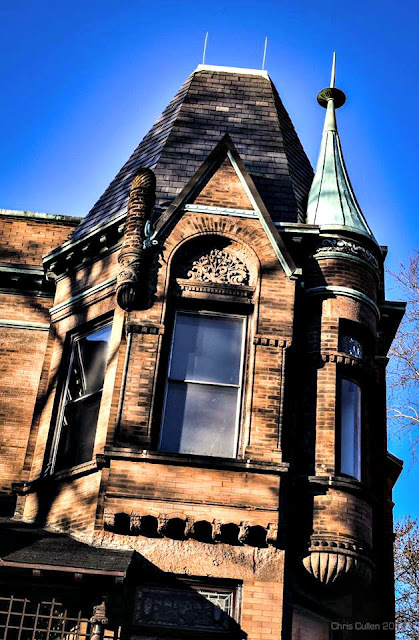 It was a shame Ravenswood did not become a neighborhood of its own - just say'in. 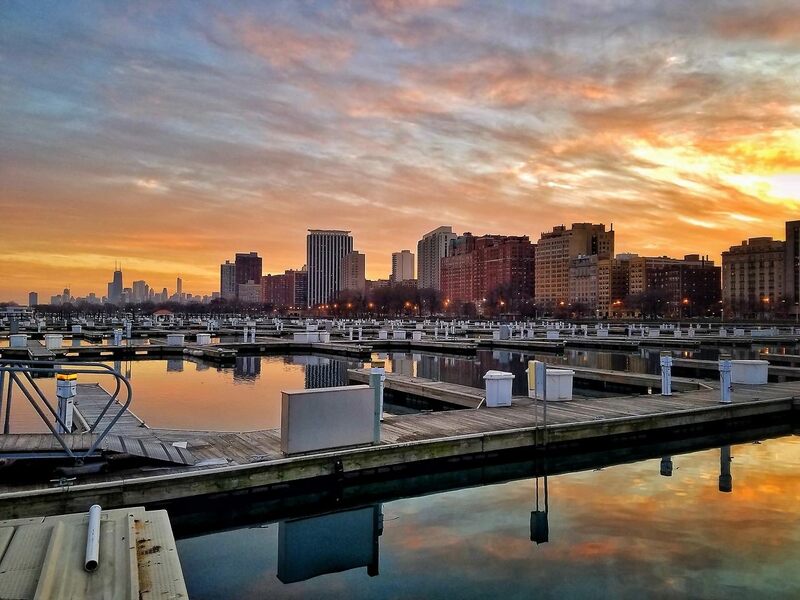 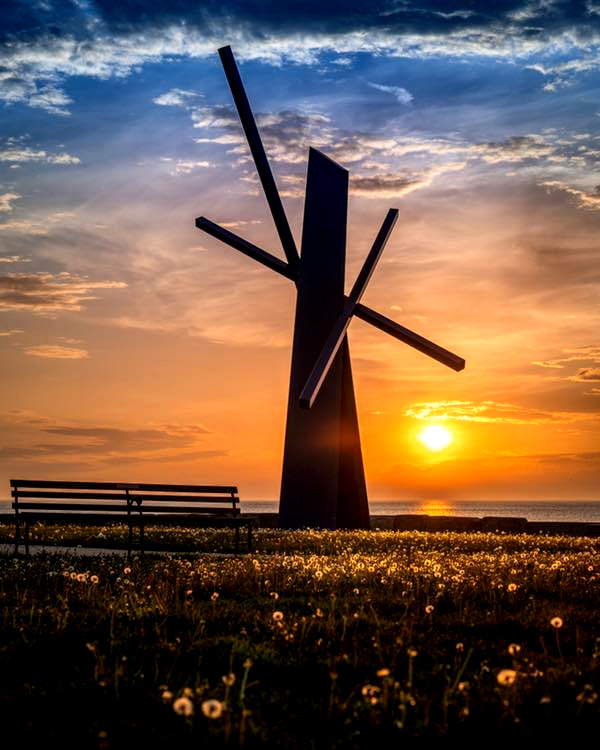 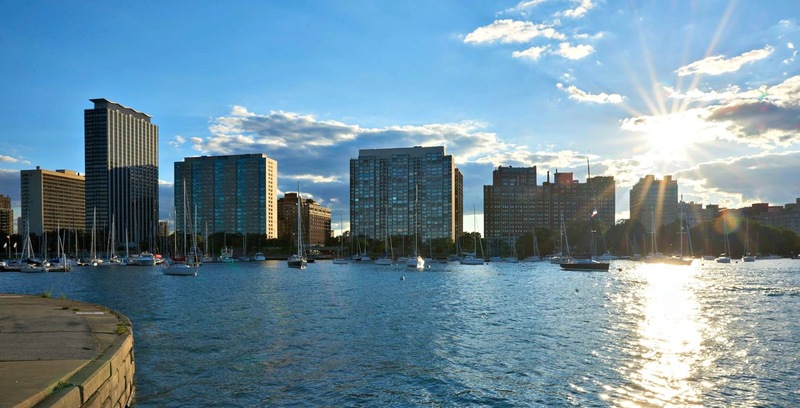 This waterfront area spans north from Diversey Parkway (2800 N) to Irving Park Road (4000 N), and west from Lake Michigan to Halsted Street (800 W). 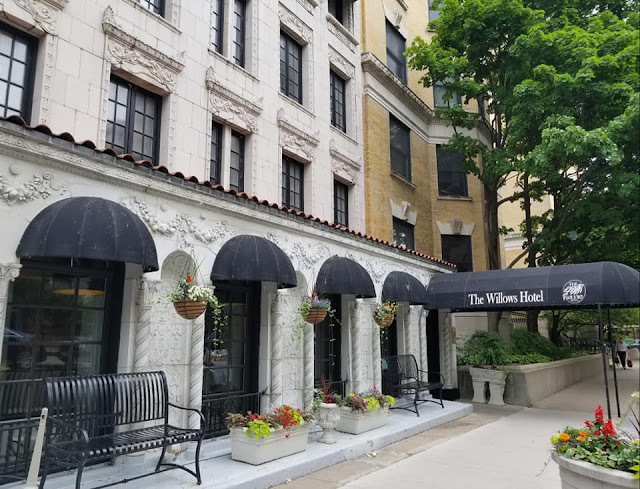 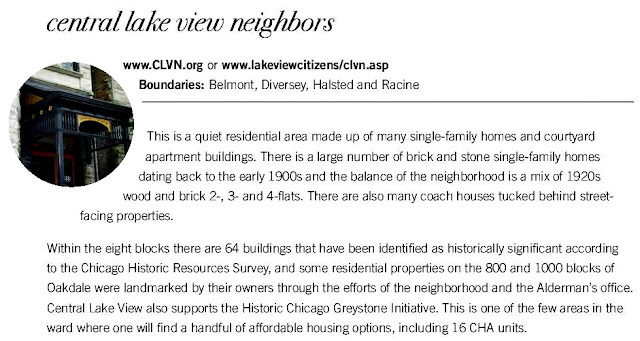 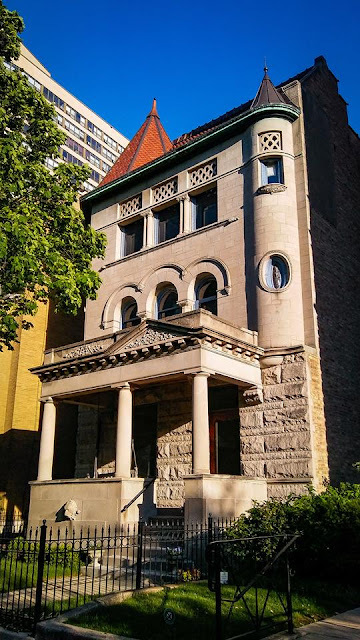 This neighborhood of Lake View East is the home of the Community Areas' namesake - The Lake View Hotel (House) that was once located on the original edge of the lakefront on Grace Street. 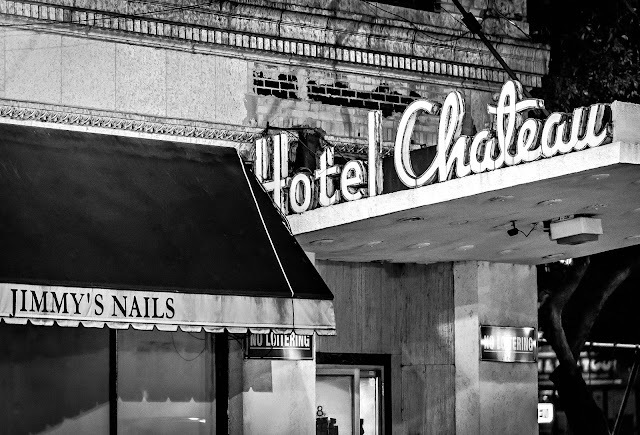 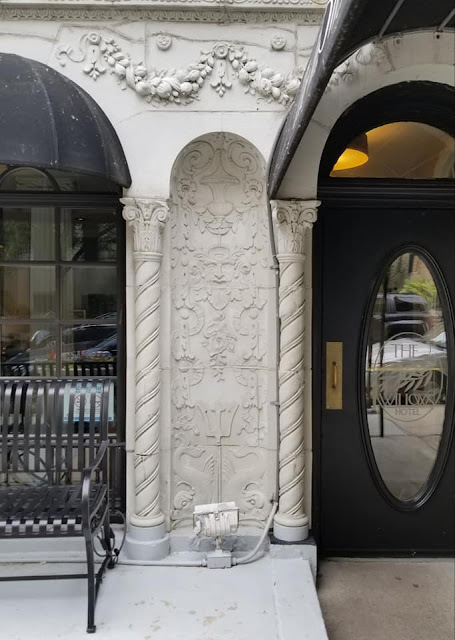 Apparently, the hotel was constructed in 1853 during pre-township days to 1890-ish after the annexation of the City of Lake View by the City of Chicago in 1889. 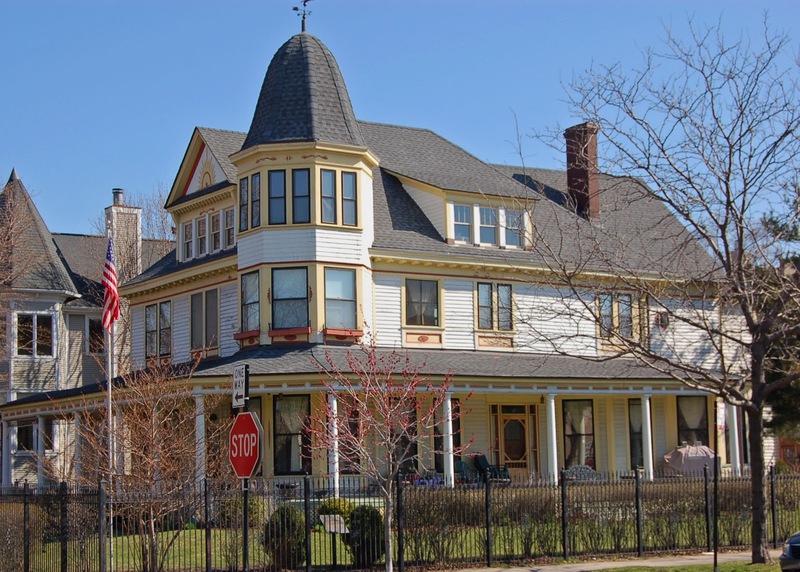 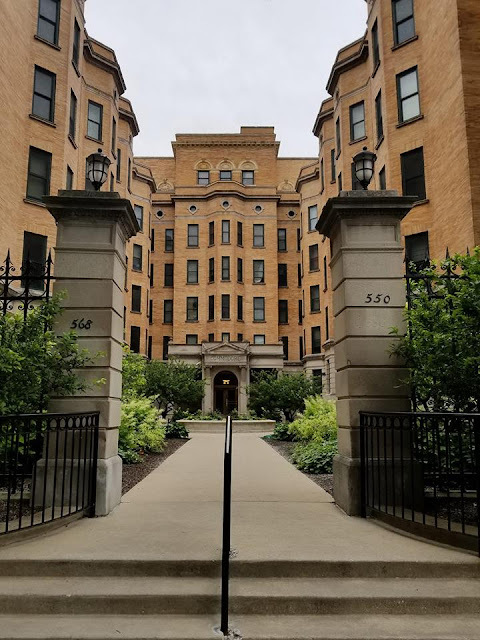 This community within the neighborhood of Lake View is the home of the neighborhoods' namesake - The Lake View Hotel (House) that was once located on the original edge of the lakefront on Grace Street. 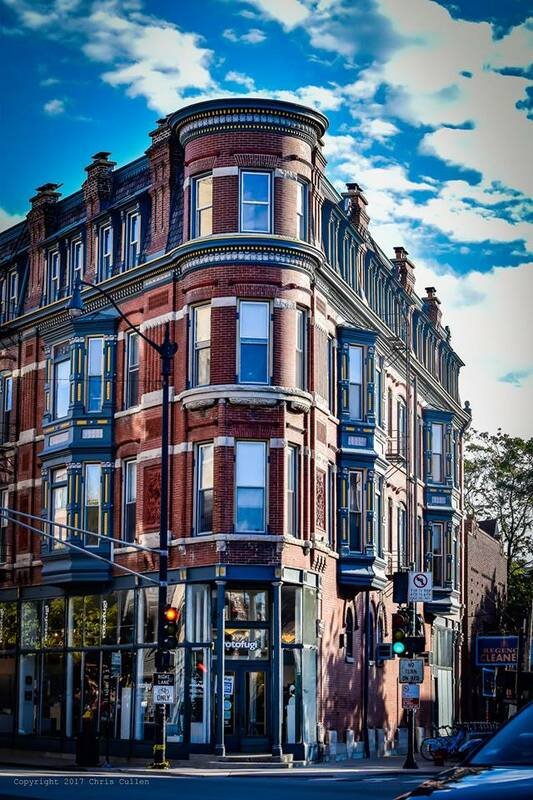 Apparently, the hotel was constructed in 1853 during pre-township days to 1890-ish after the annexation of the City of Lake View by the City of Chicago in 1889. Elisha Hundley owned a major portion of the subdivision of Pine Grove until his death by 1874. As shown in the above illustration map he owned property from Cornelia Street to both sides of Grace Street (hotel shown); from the original lakefront to Evanston (Broadway) Avenue. 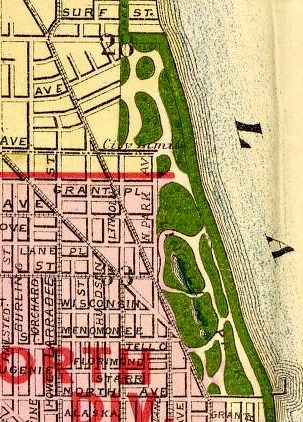 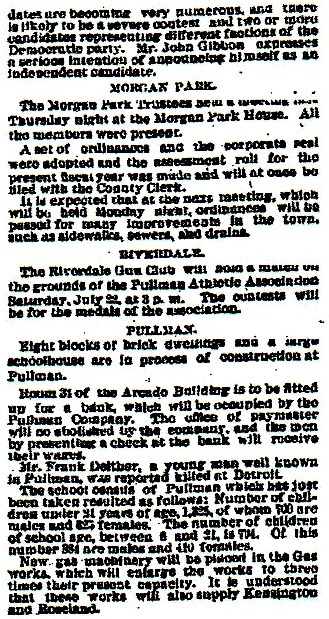 This illustration is from a 1892 Daily Tribune article highlighting the future of the strip of his lakefront to be called Sheridan Road. 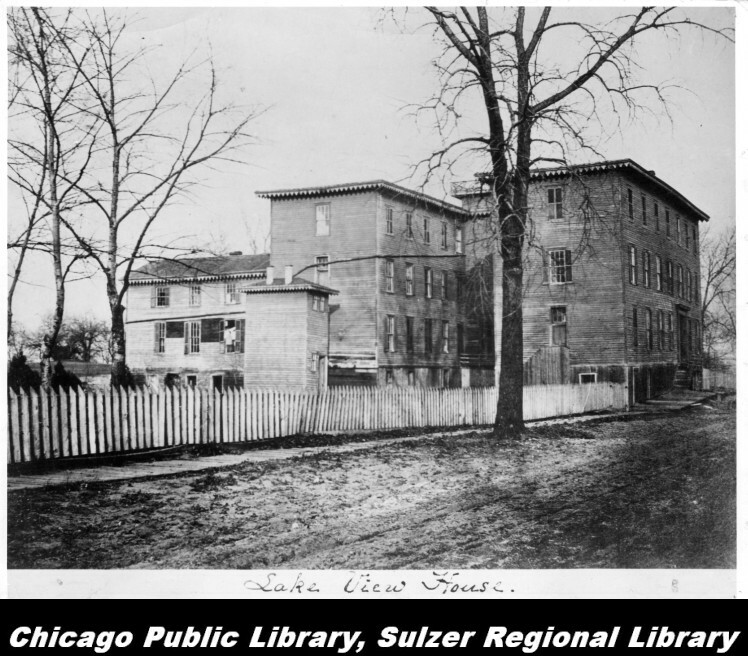 The first building - photo 1860's? 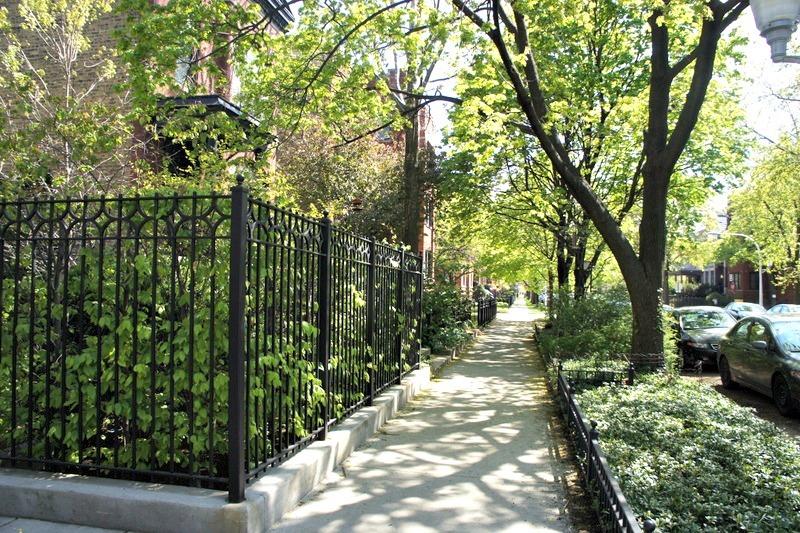 to Racine Avenue (1200 W). Love this video! Facebook it! and those Cubs! 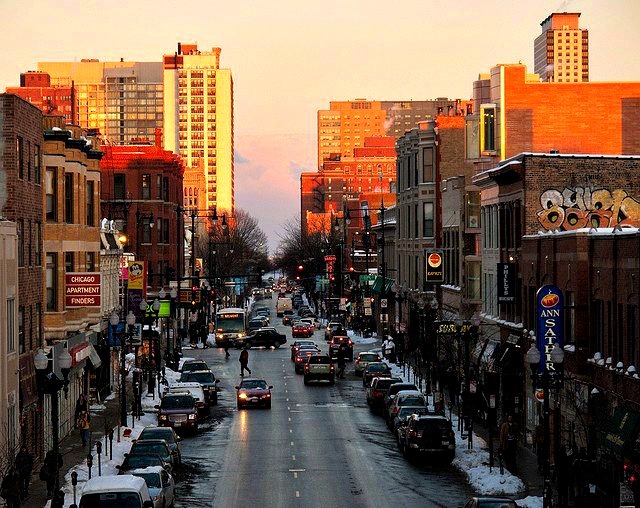 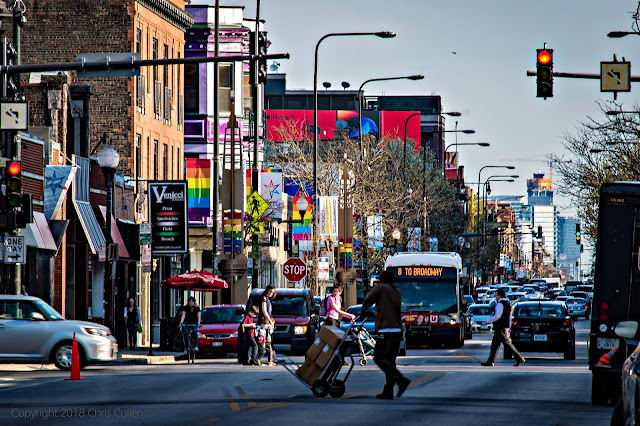 Boystown developed from the wake of a small and diverse neighborhood called New Town. 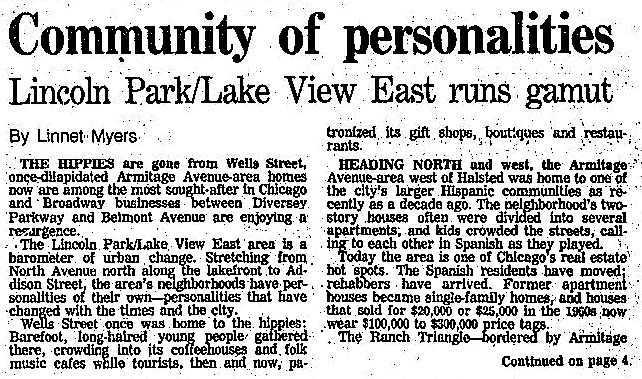 Real estate marketers tried to created a new climate for this area that was once called Lake View East. 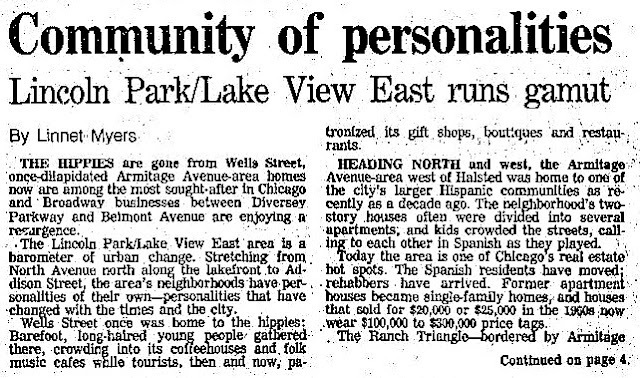 This was an era of ethnic & social flux from 1968-1984 for this area of Lake View. 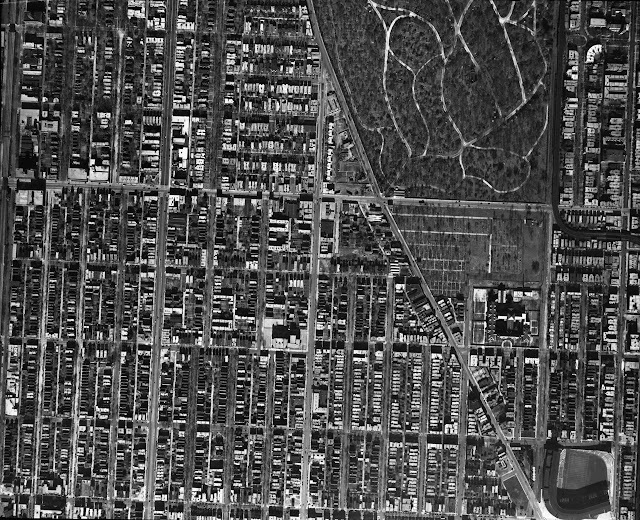 The geography of this small area was bit confusing sometimes for most residents of the city as well as the neighborhood residents. 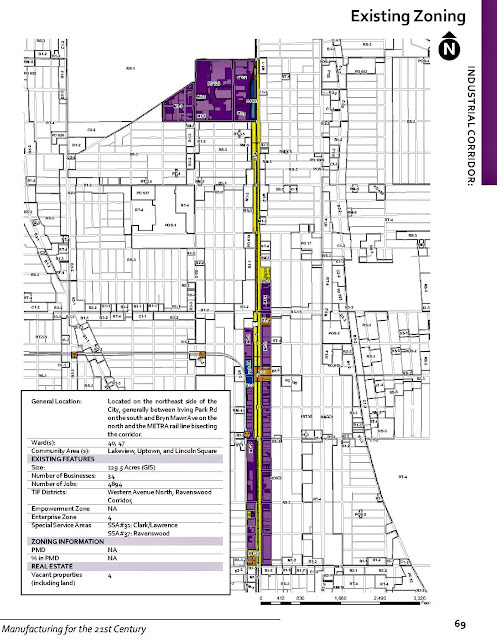 Basically the border area were Diversey Parkway to the south, Belmont Avenue to the north, Sheffield Avenue or Halsted Street to the west, east to the lakefront. 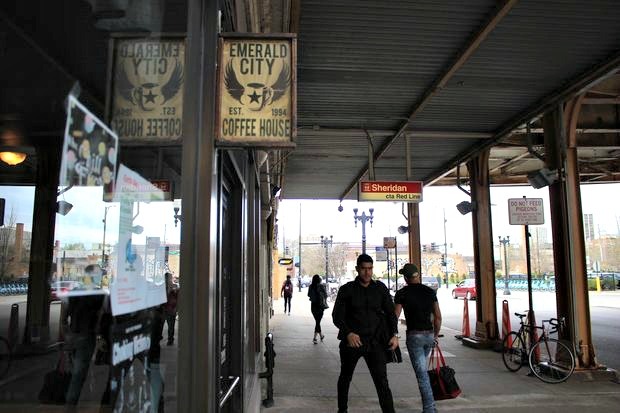 This new area was to mimic Old Town along North Avenue. 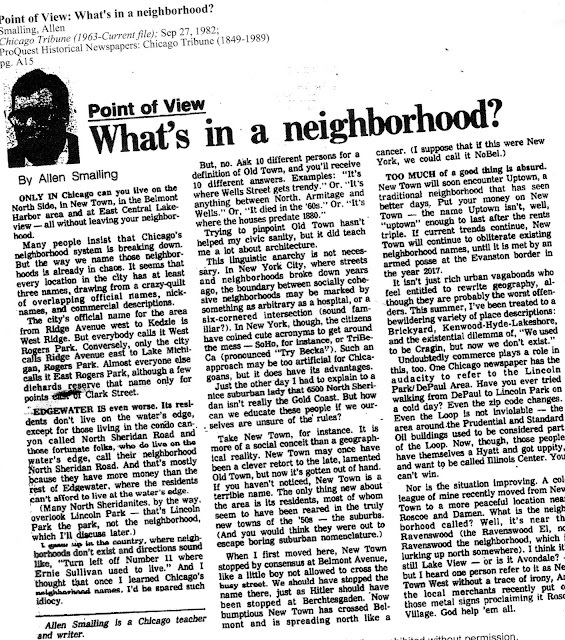 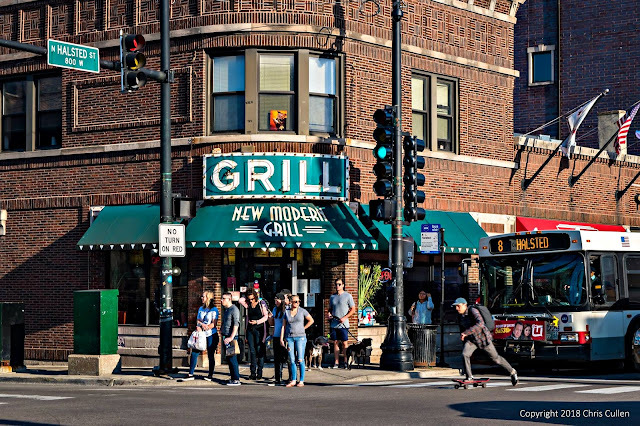 By the mid 1980's the words 'New Town' had disappear and the name of Lake View East reappeared as a lexicon of communities in Chicago. 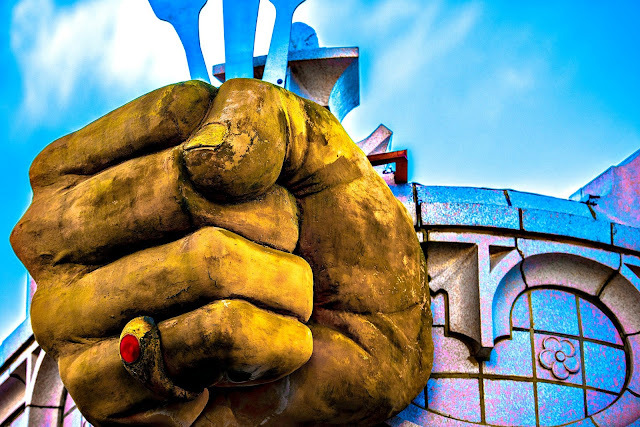 Facebook it! 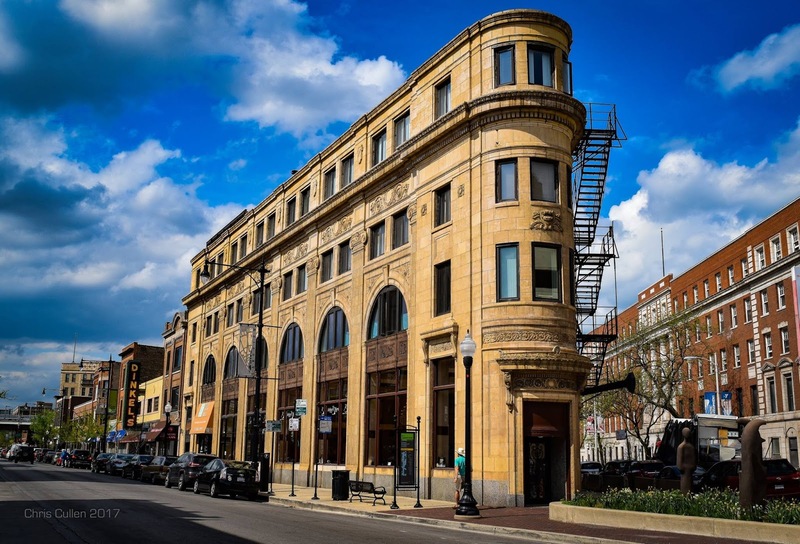 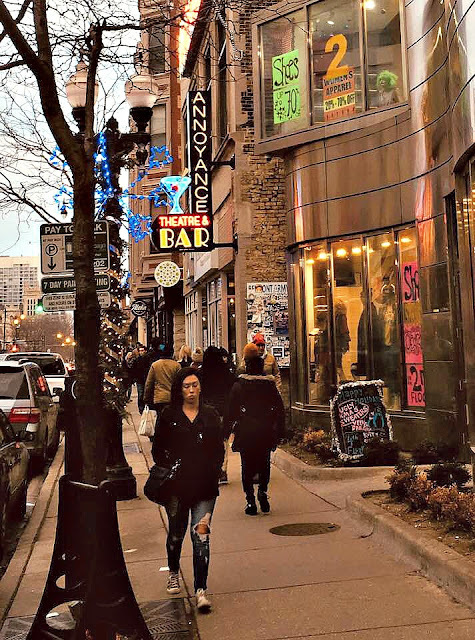 This area covered most of Lake View East and was to market the area as something new and different like the area known as Old Town - diverse and trendy. 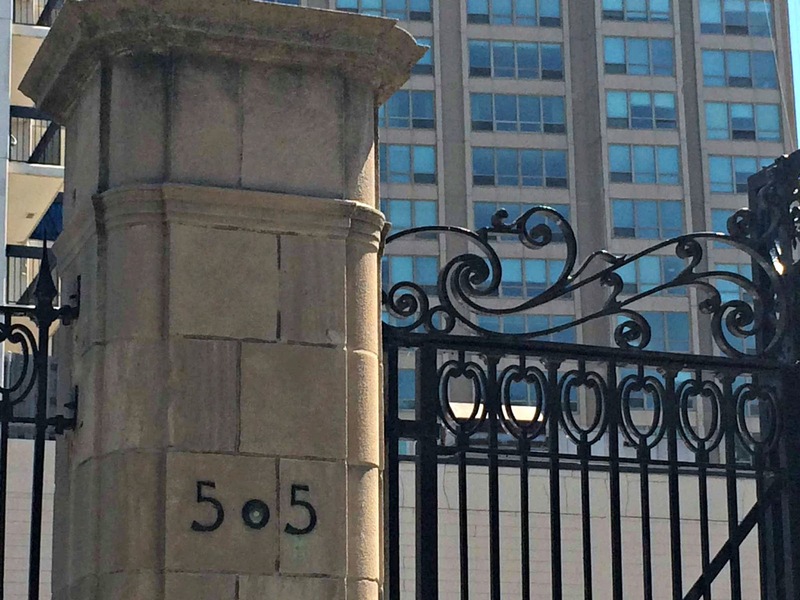 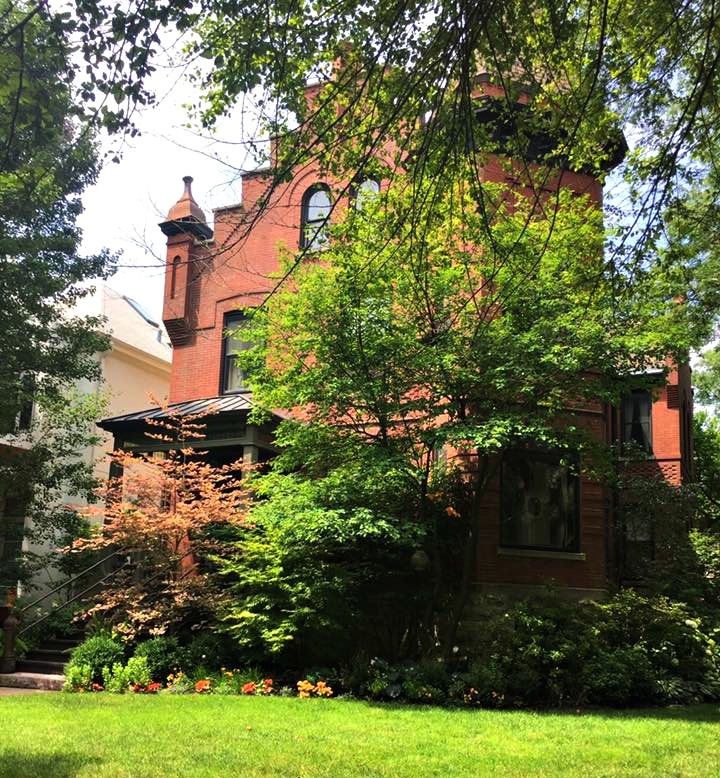 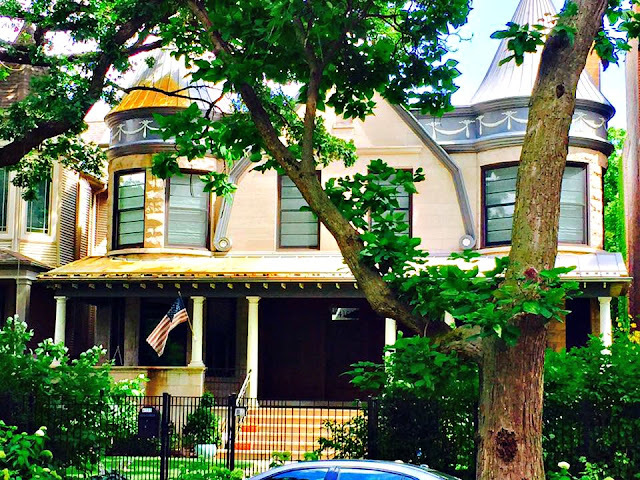 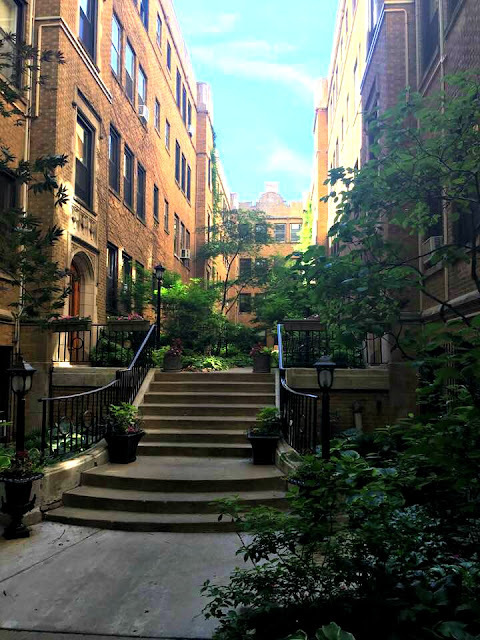 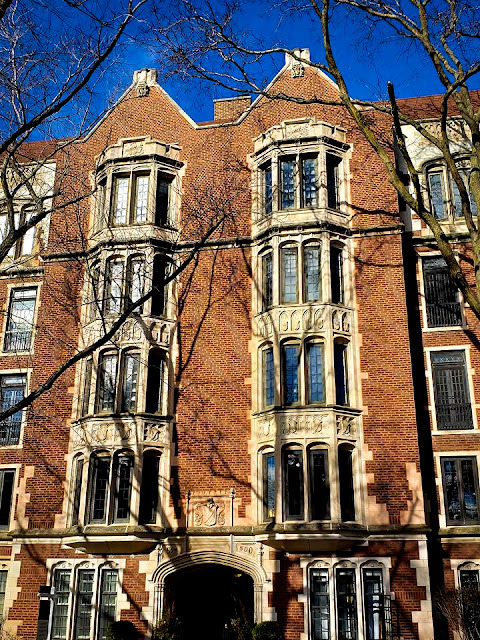 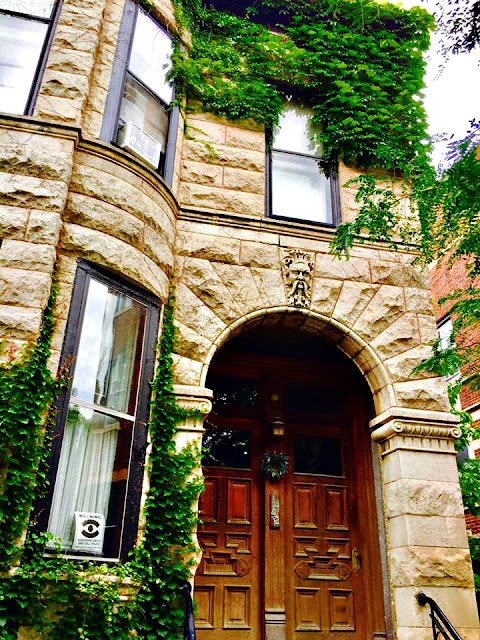 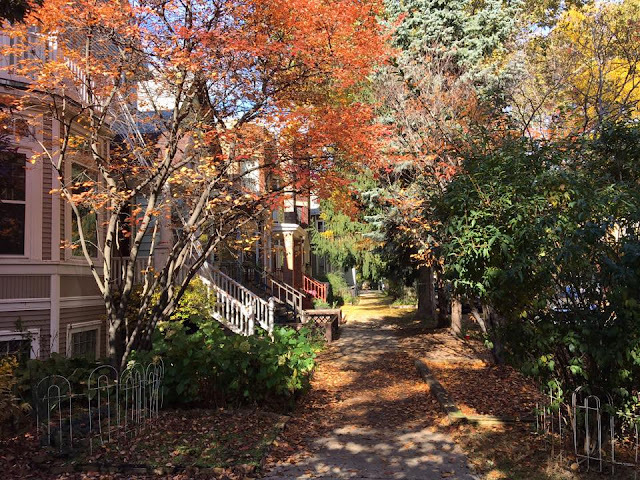 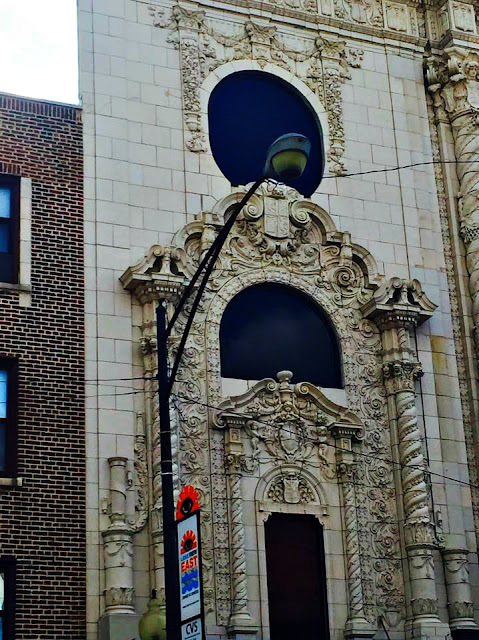 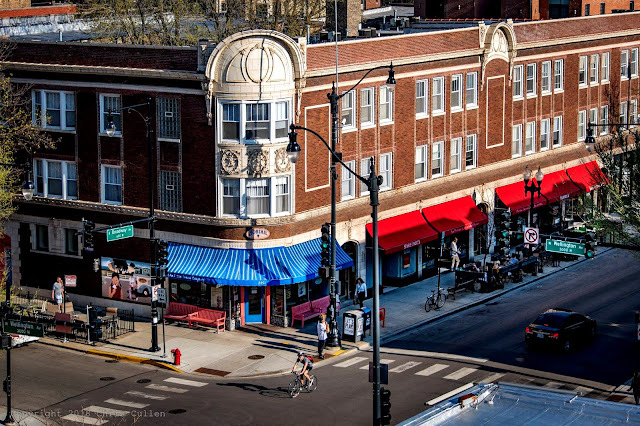 The corridor includes the properties on both East Ravenswood Avenue and West Ravenswood Avenue. The community area of Lake View ends at East Ravenswood Avenue and only as south-side on Montrose Avenue. 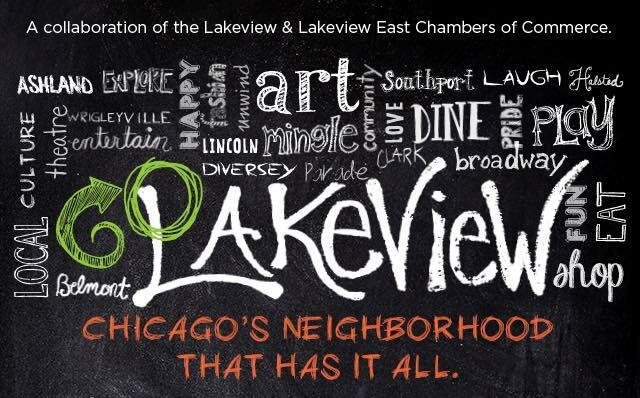 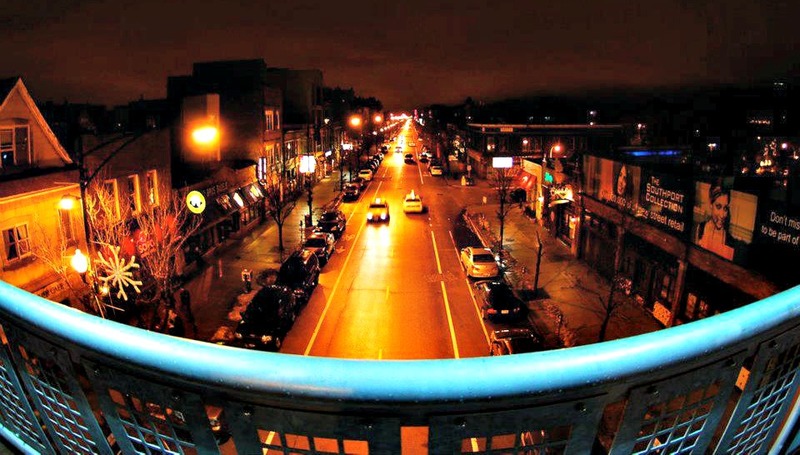 The area within Lake View is 'part and parcel' the community of East Ravenswood mentioned above. It is a separated section due to importance and its' complexity/evolution of a manufacture and residential area. This corridor that spans a number of neighborhoods is part of a TIF that began in 2005 and will expire in 2029. 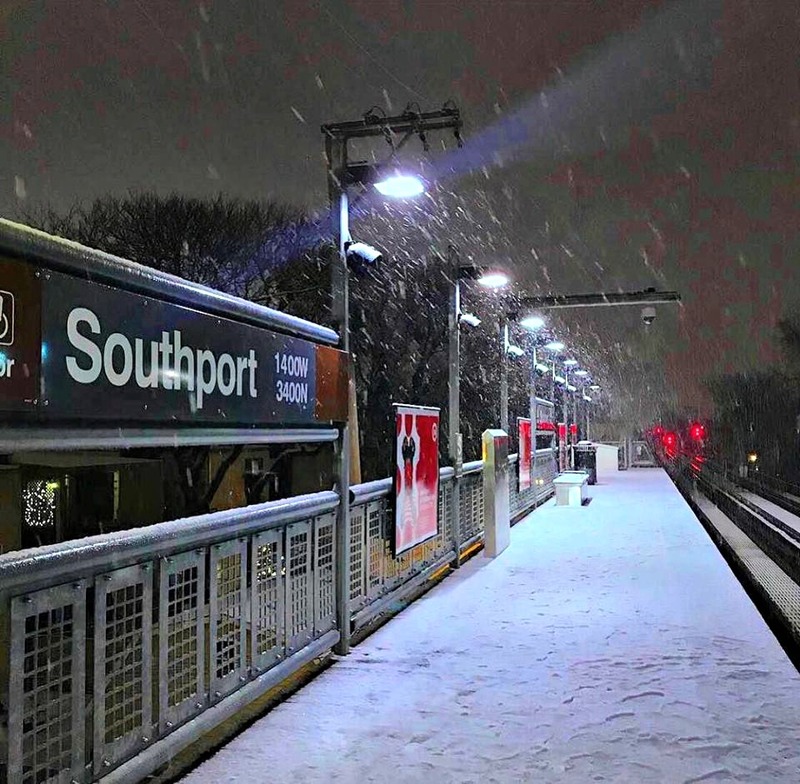 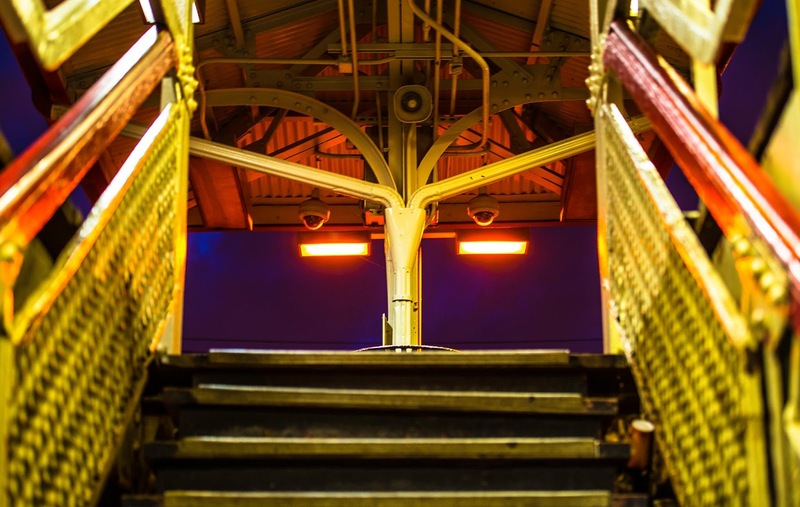 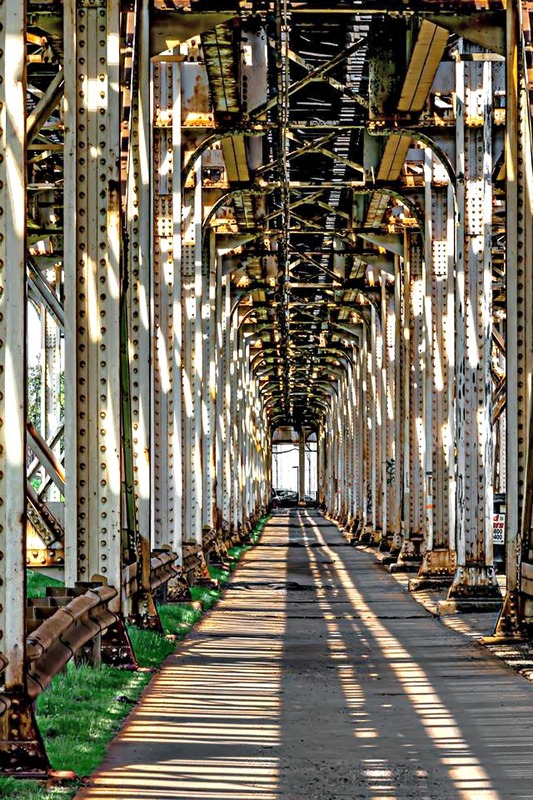 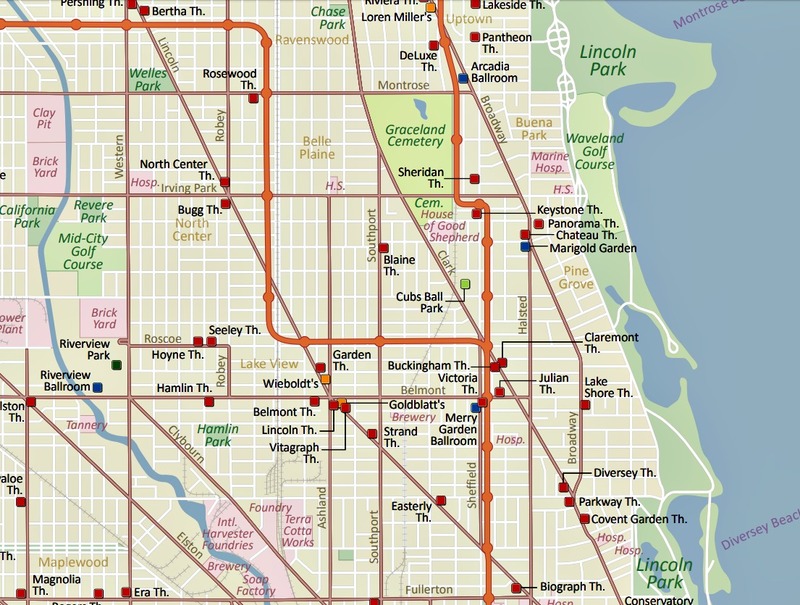 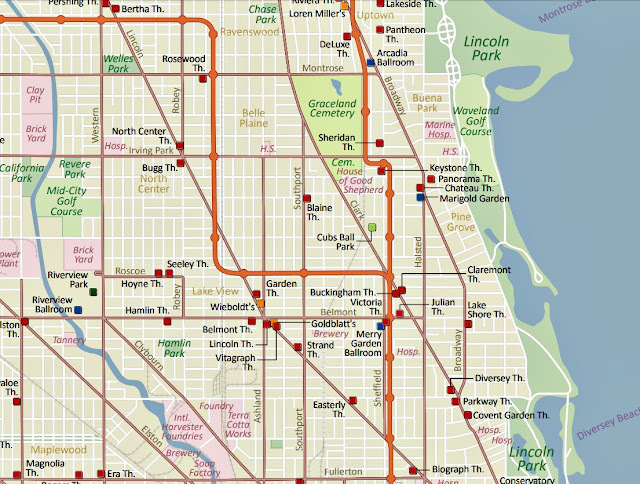 The entire corridor ranges from Irving Park Road to Bryn Mawr Avenue from Bowmanville to Lake View along the vintage Chicago & Northwestern railroad. 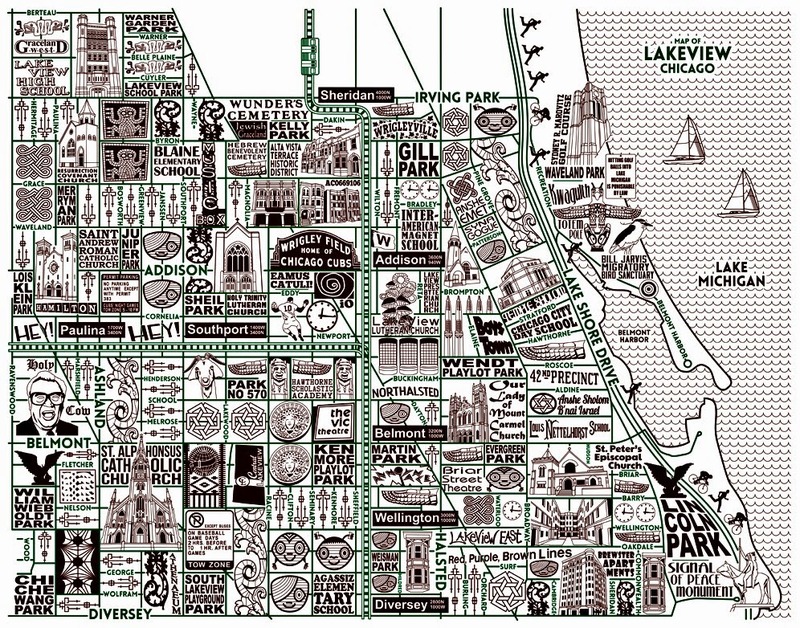 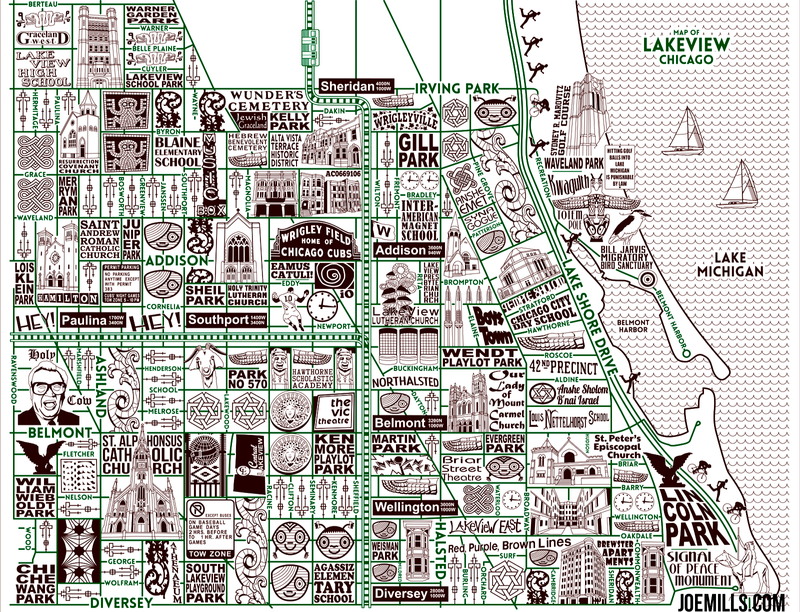 'Up and down the Ravenswood Industrial Corridor, scrappy letterpress operators and screenprinters are carving out an analog niche in the digital world, setting type with their fingers instead of keystrokes and cranking out greeting cards and prints one piece of paper at a time by hand—kind of like swapping out an iPhone for a rotary model. 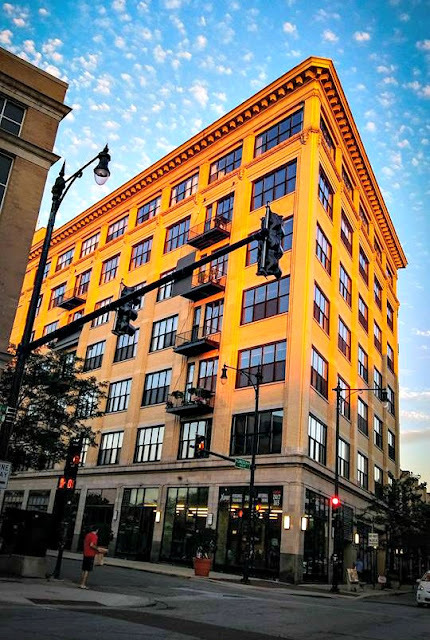 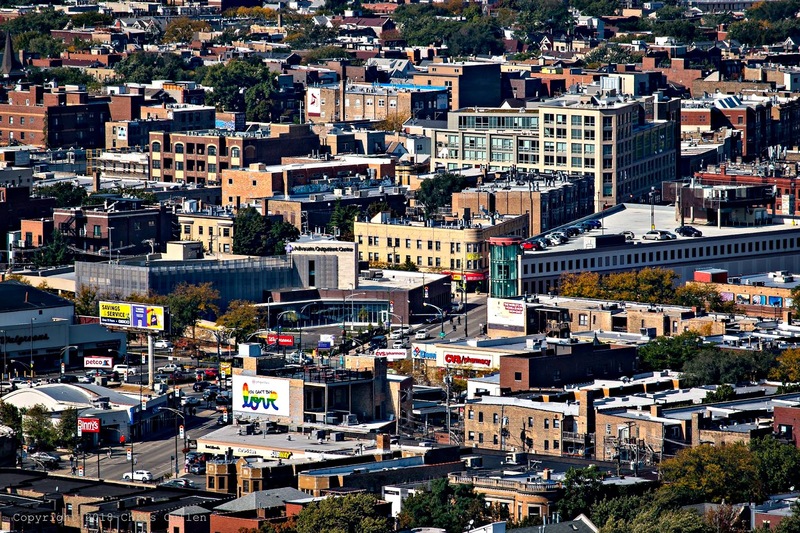 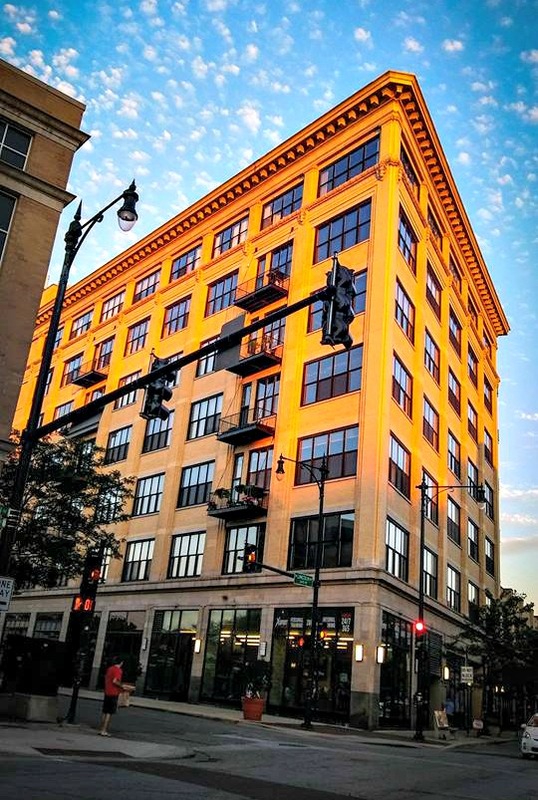 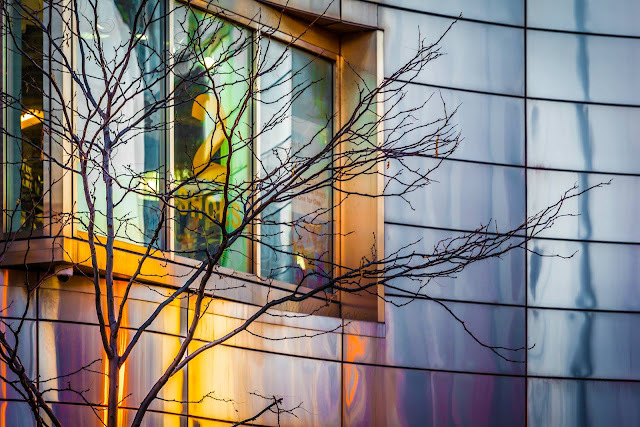 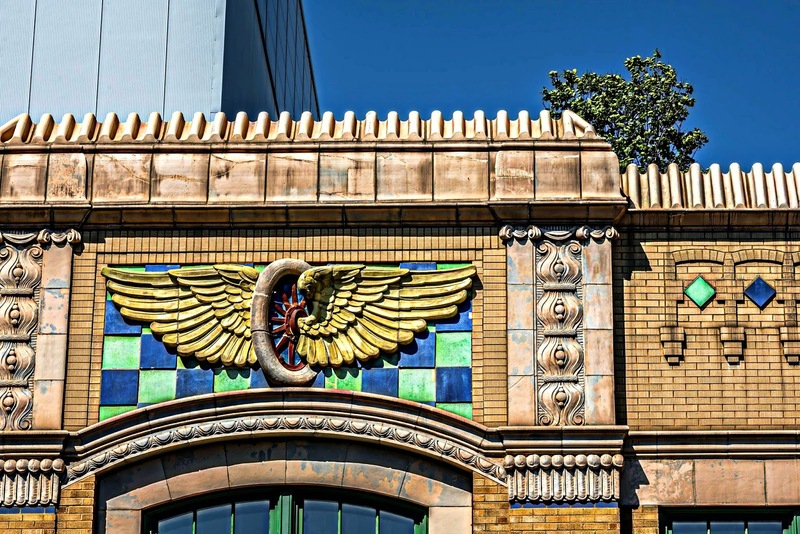 Just like Printer’s Row, the corridor was hit hard by automation, innovation and consolidation, which rendered many of Ravenswood’s manufacturing plants and the products they produced obsolete. Though a handful of the corridor’s abandoned factories were converted to loft-style condos, plenty weren’t. 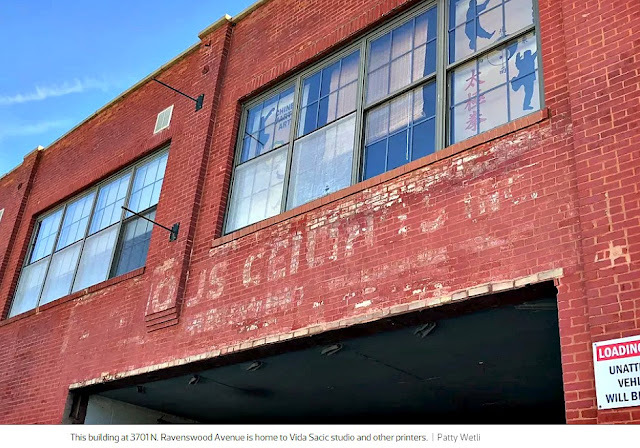 Building owners carved up these cavernous plants into warrens of studios that happen to be the right size and the right price for printers, and it doesn’t hurt that the spaces look cool too.' 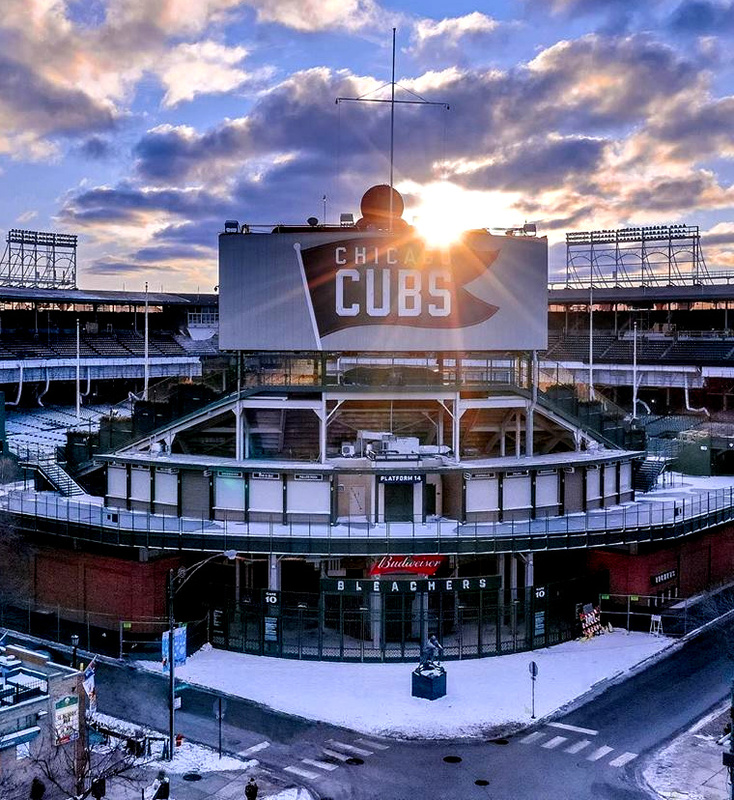 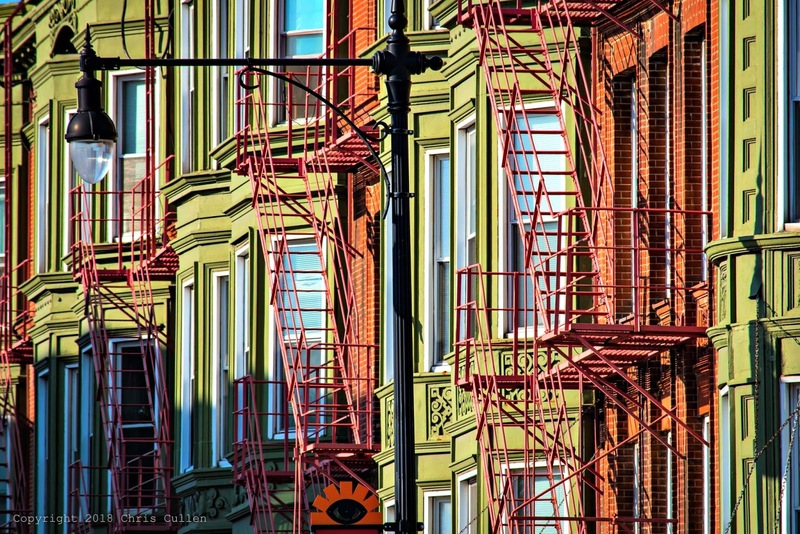 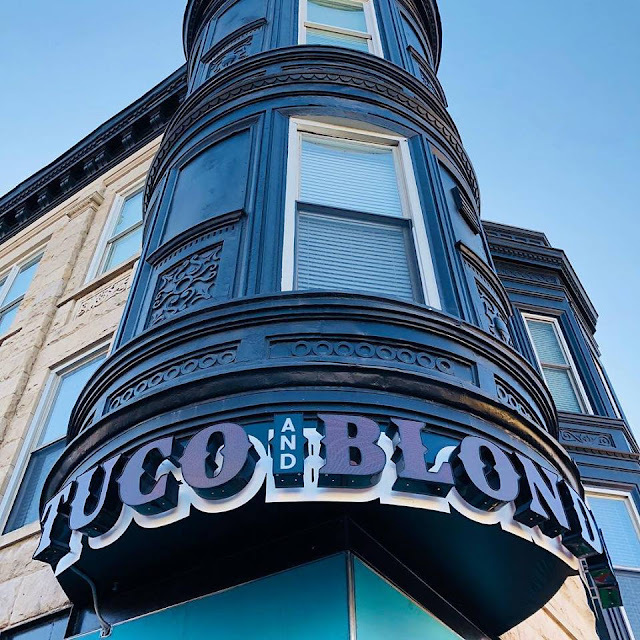 per title link above from Curbed Chicago. 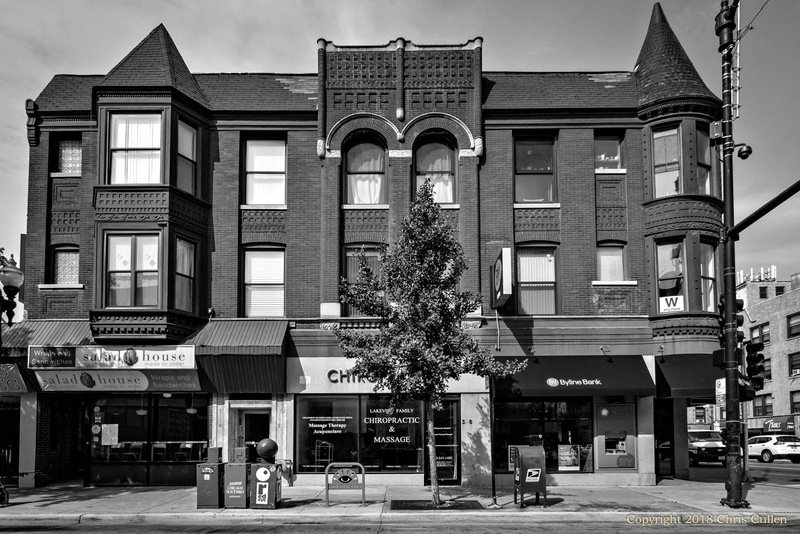 are Belmont Ave (3200 N) and Grace St (3800 N). 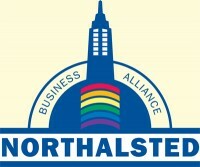 Visit their blog as well. 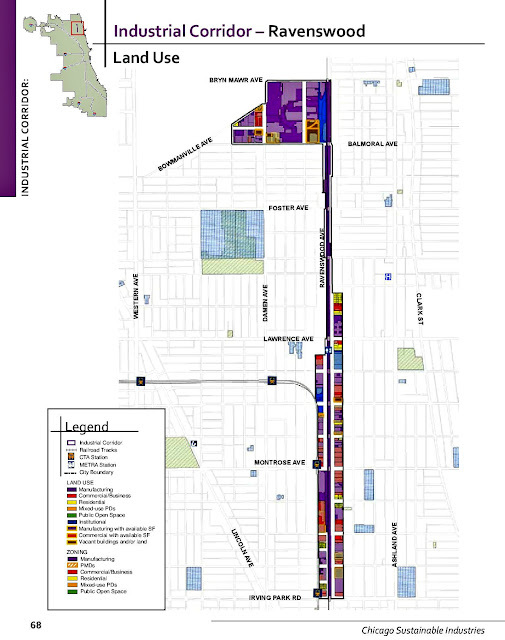 A New Corridor Planned in 2017? 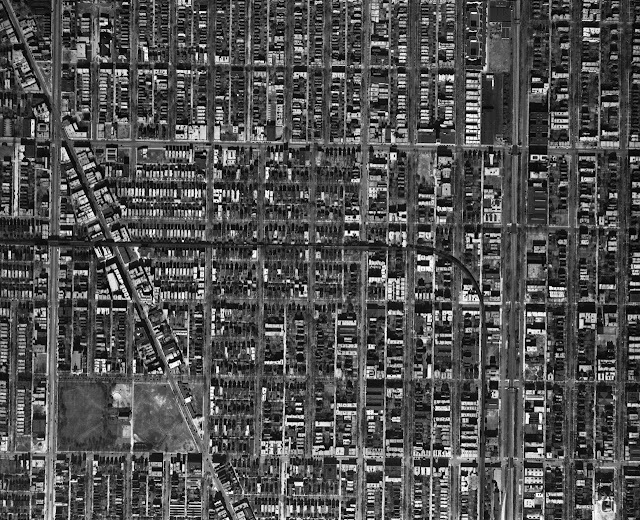 "I lived in the neighborhood (Patterson Avenue) from 1945-1955, and then my family moved to a house in suburbia. 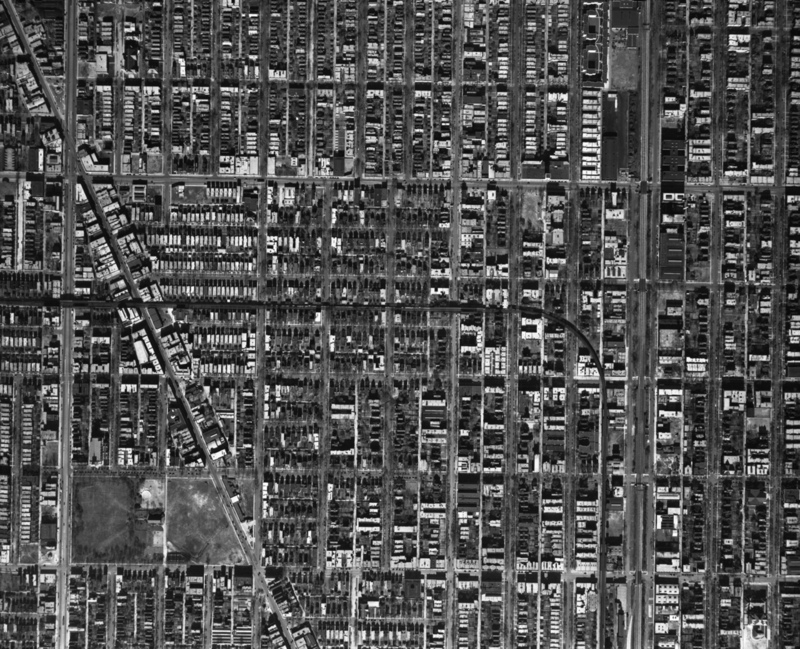 It was a wonderful neighborhood to grow up in at that time. 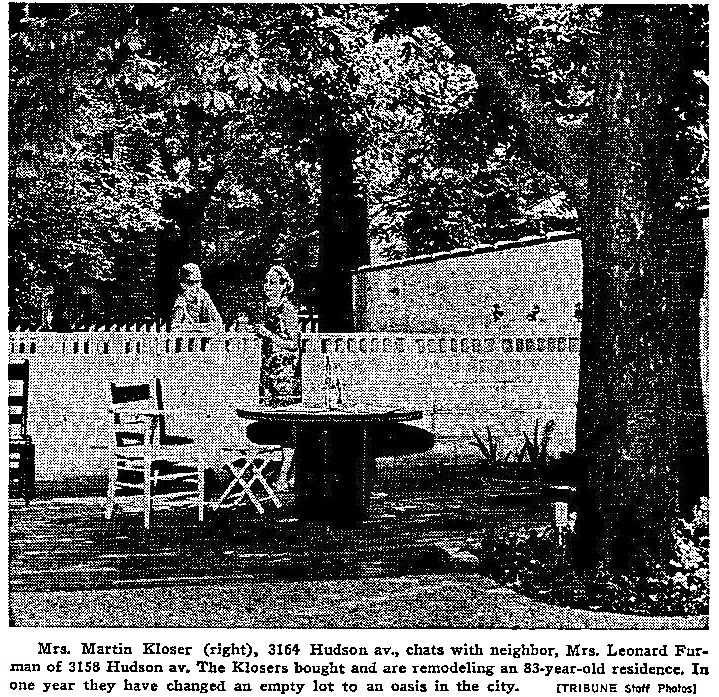 Everyone knew their neighbors and everyone was friendly. 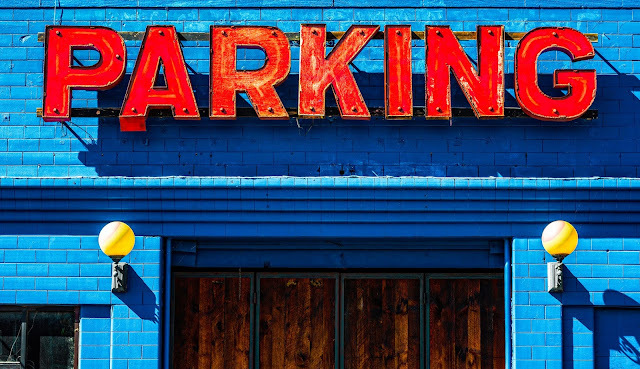 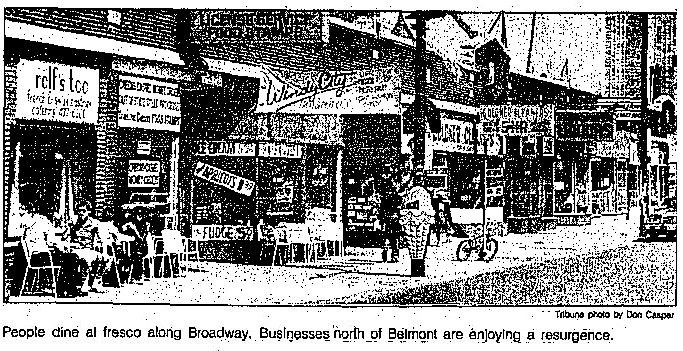 There were all kinds of grocery shopping on Broadway -- everything you could imagine; a butcher shop, a fresh fish store, grocery stores, a huge Woolworths at Irving Park and Broadway. 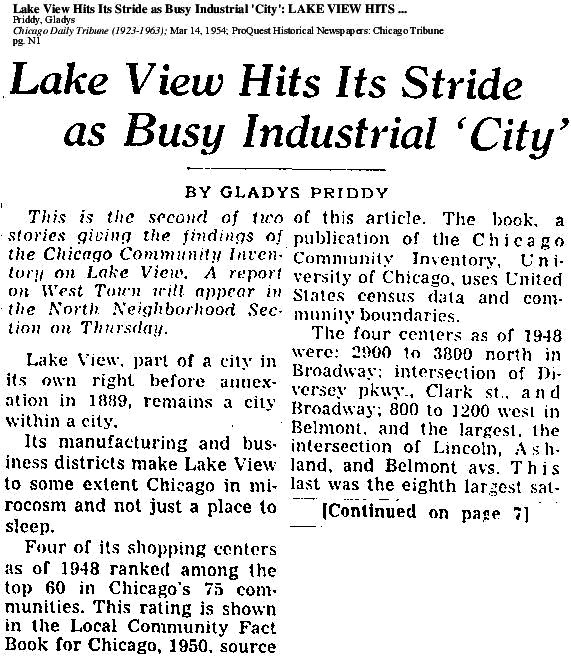 In the other direction was a couple of children's shoe stores, two drug stores on the corner of Addison and Broadway. 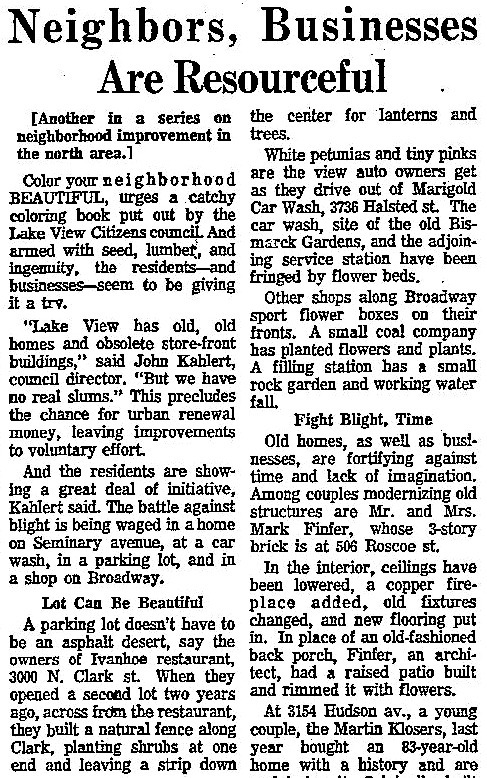 Just to the south of Patterson on the east side of the street was Millie's dime store which was a tiny version of FW Woolworth's. 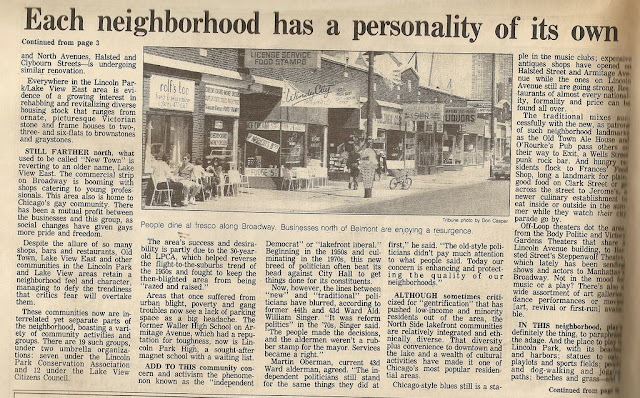 At Patterson and Broadway was Borden's Dairy on the west side of the street. 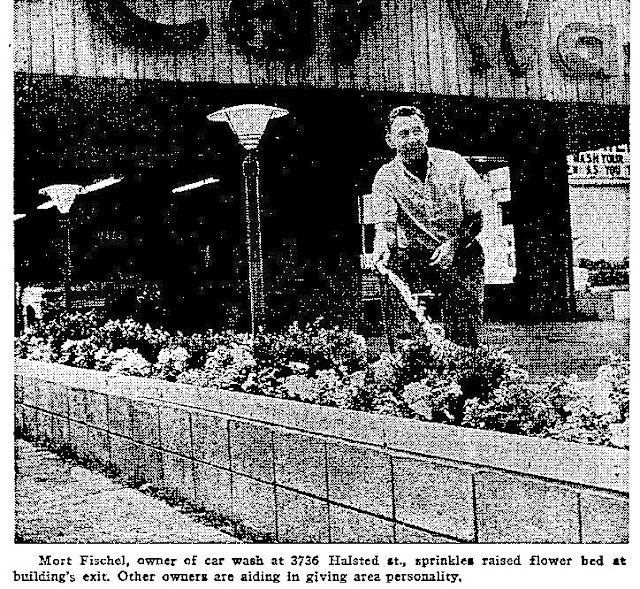 There was a large indoor parking garage there, and that's where my dad parked his car. The "streetcars" were on Broadway, then came the Green Hornets and then regular buses. 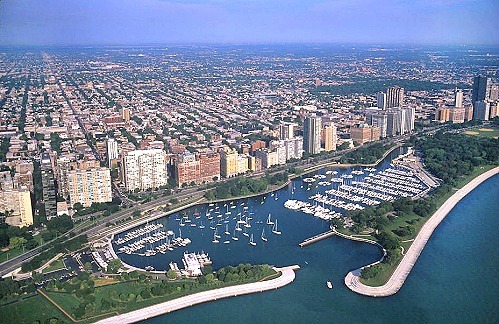 It was a wonderful, much less stressful way of life. 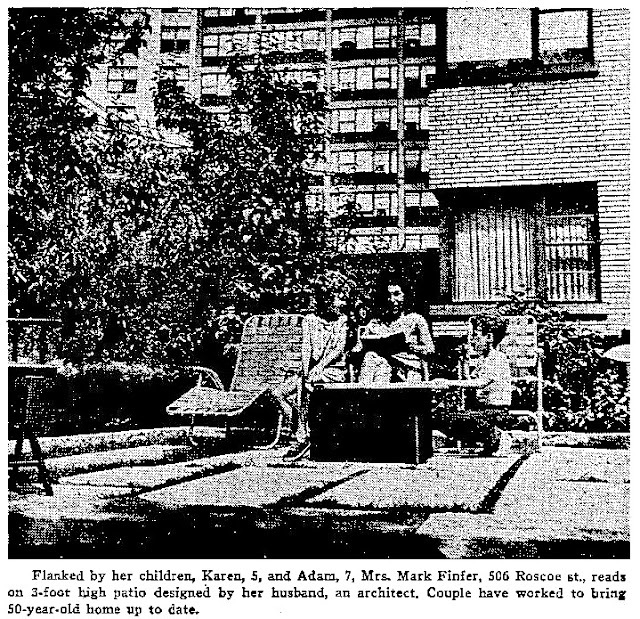 We were one of the first people on our block to get a television (10" screen), so all the kids hung out at our apartment. And..... 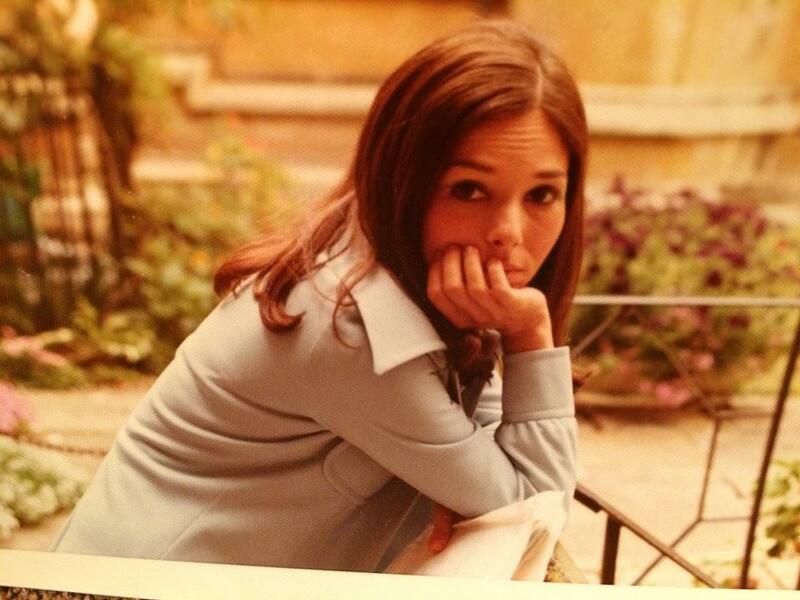 I found a rent receipt in one of my mom's old cookbooks several years ago. It [our apt] was for $40.00 -- for a one bedroom, one bath apartment with a tiny kitchen, a large dining room, living room and a sun parlor. 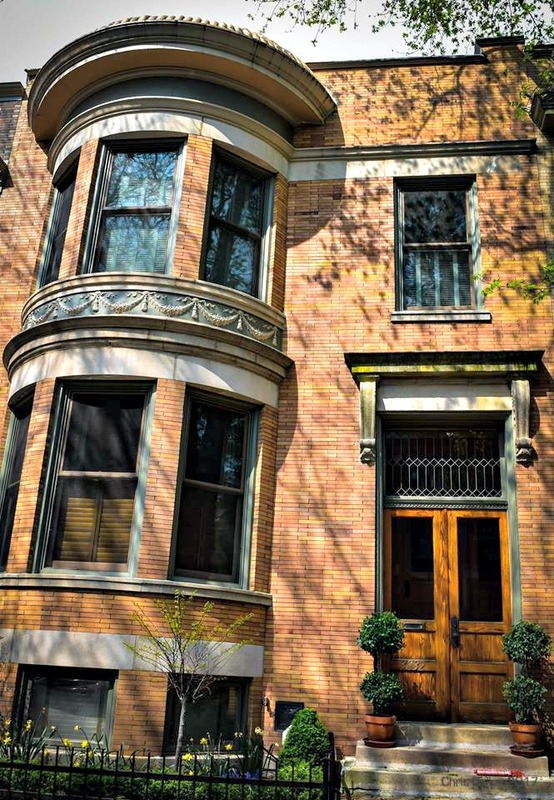 It also had a Murphy bed on the living room wall. 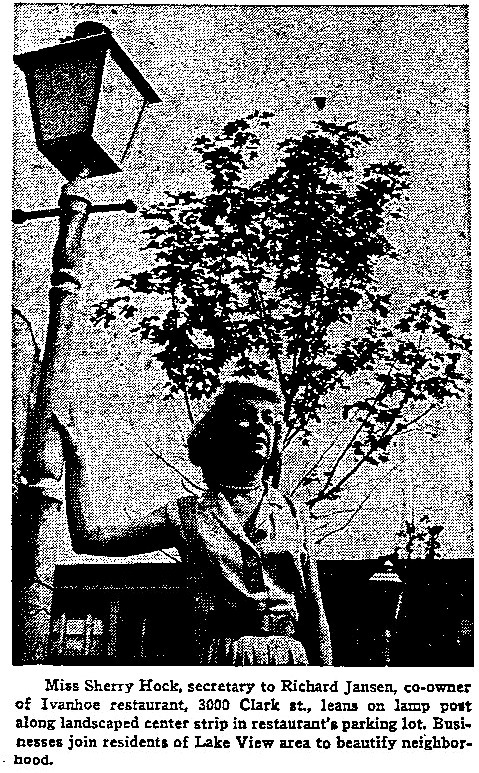 We had radiators... and the coal was delivered to the basement where the washing machine (with wringers) was, and women used to hang their clothes to dry on rope with clothespins that was hung in the basement. My mother used to send a lot of her laundry out... linens, my dad's undershorts, rags and the shirts my dad wore to work. 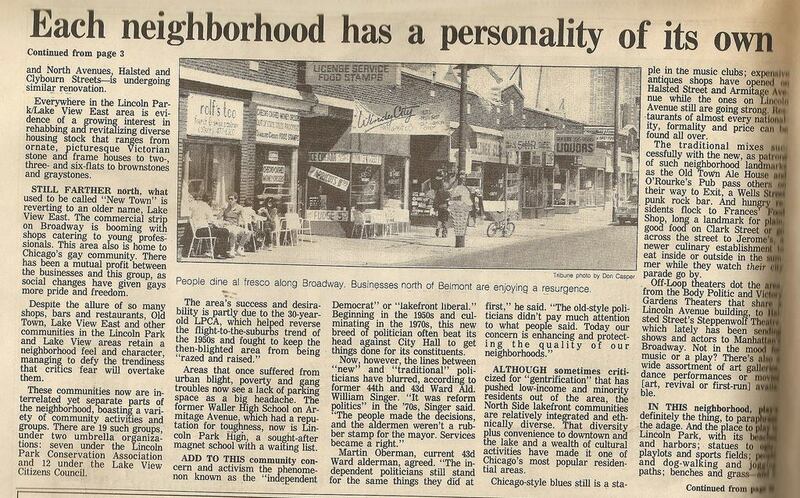 Such fond memories of a wonderful neighborhood and very decent people. I also went to Le Moyne school through 4th grade. 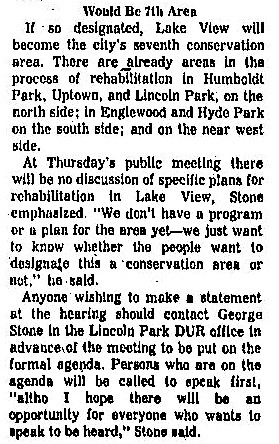 At that time, the Chicago public schools were way ahead of the educational system in suburbia. Even though we can never turn back the clock, it's nice to reminisce about wonderful things and times in one's life. 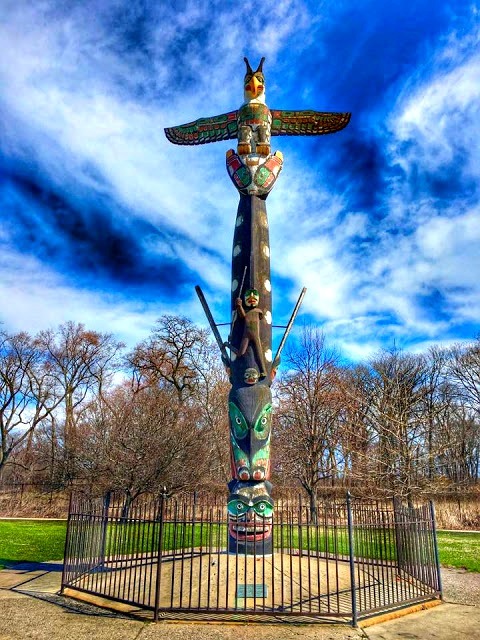 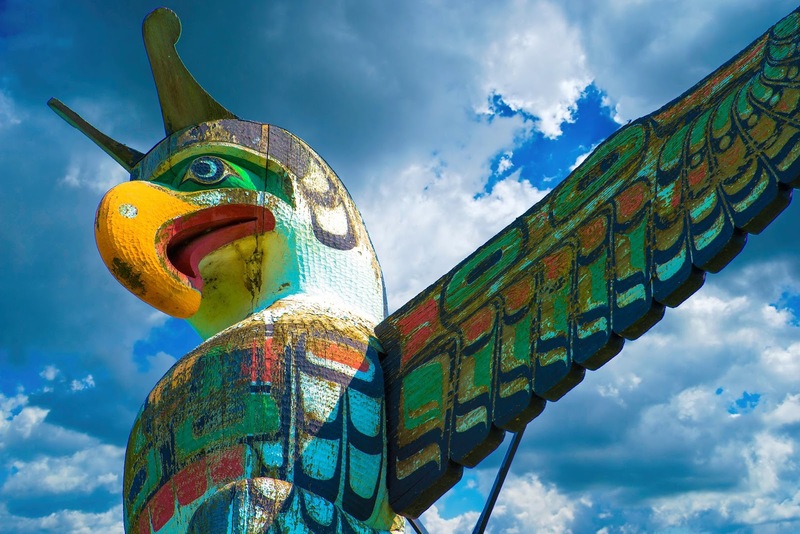 Thanks for filling in the blanks and sharing your information about the rocks and the totem pole." 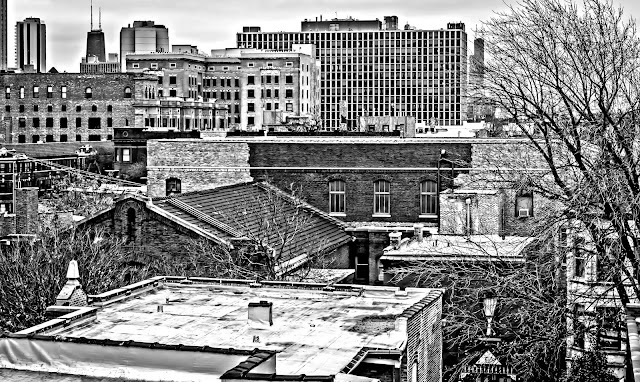 You have notice the collection of professional photographs on this page primary from two artists. 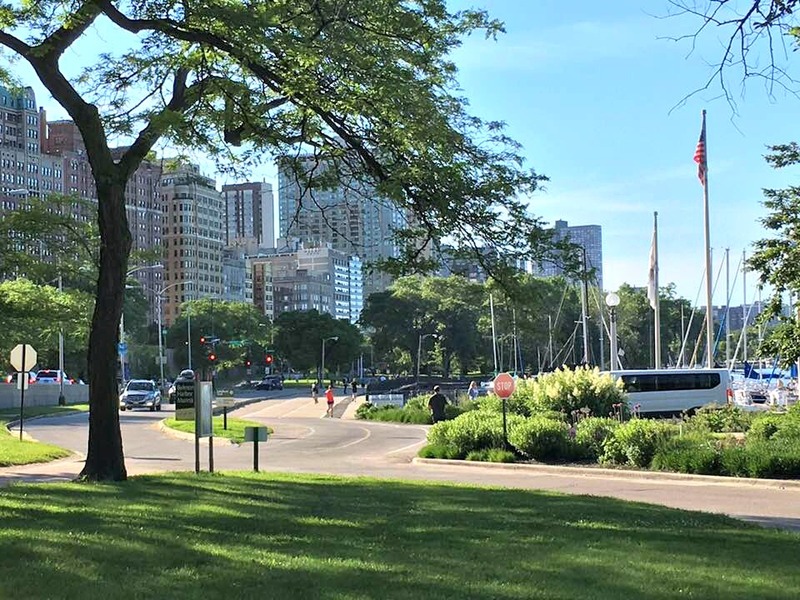 I would to follow in their foot-steps in a way - but to photograph current Lake View in a " flexible approach, designed for people who want to document and use the LENS method: look, explore, narrate, & summarize. It’s about how to do your own urban diary and define your own personal city." I got this idea via Curbed Chicago about 'urbanism' and photographer Chuck Wolfe who published a book called 'Seeing the Better City'. 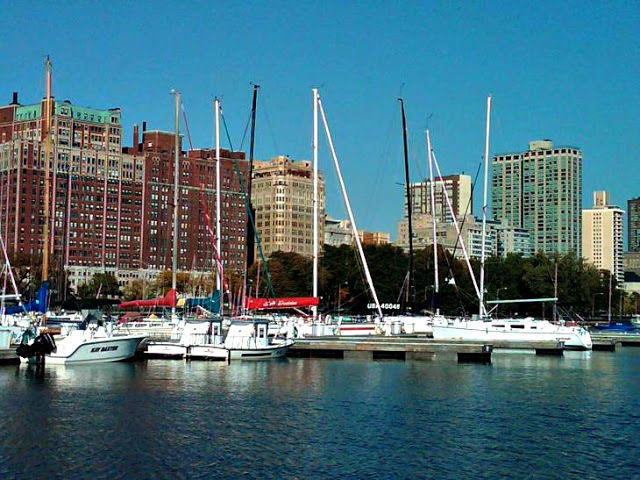 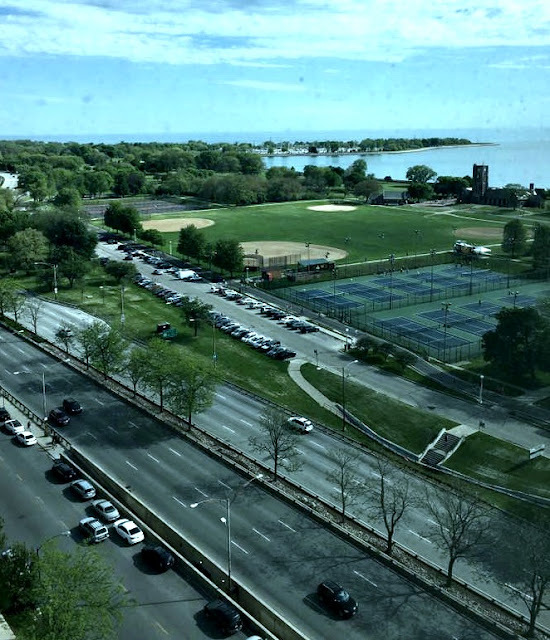 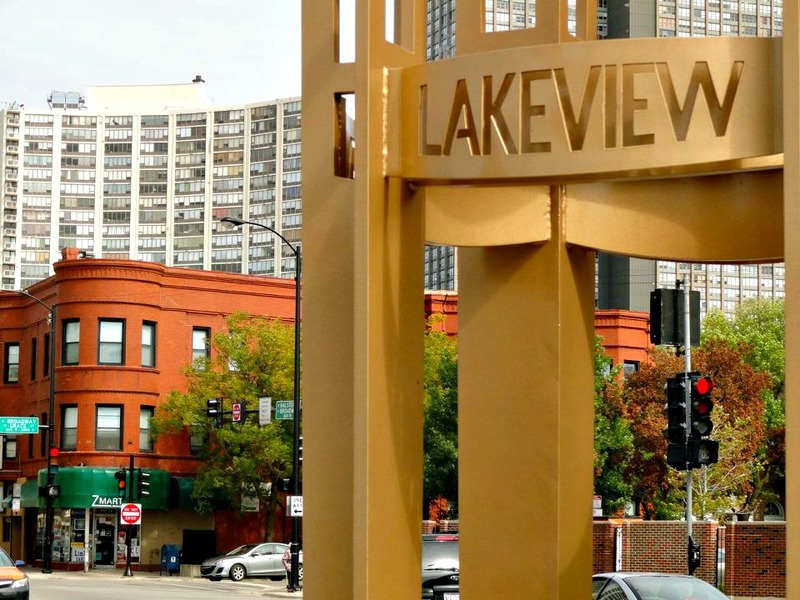 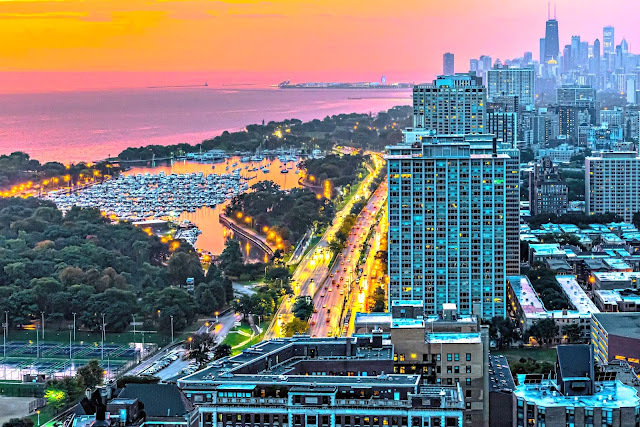 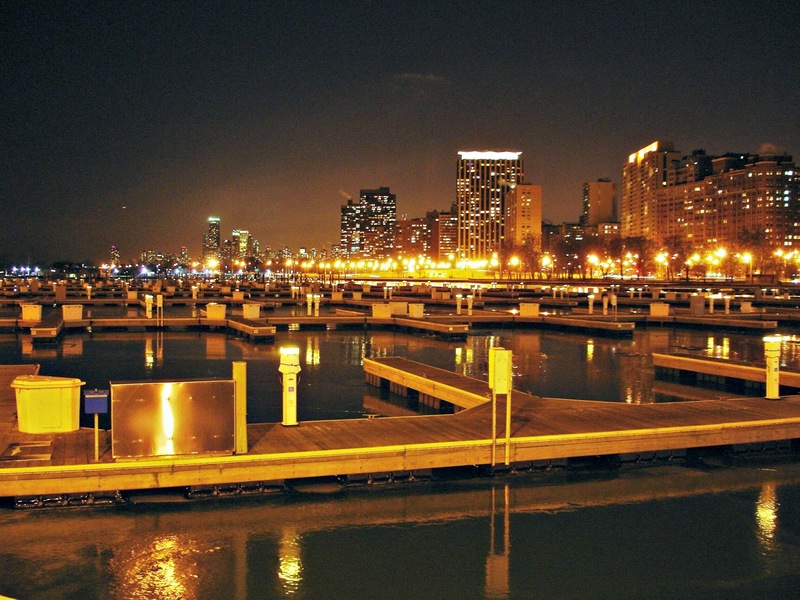 Lake View is one of the 77 'community area' in the City of Chicago. 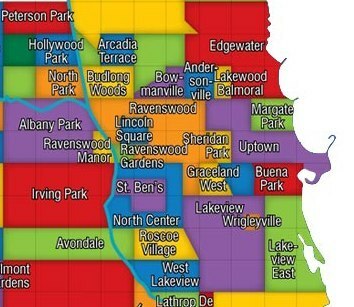 Explore the other community areas with this link. 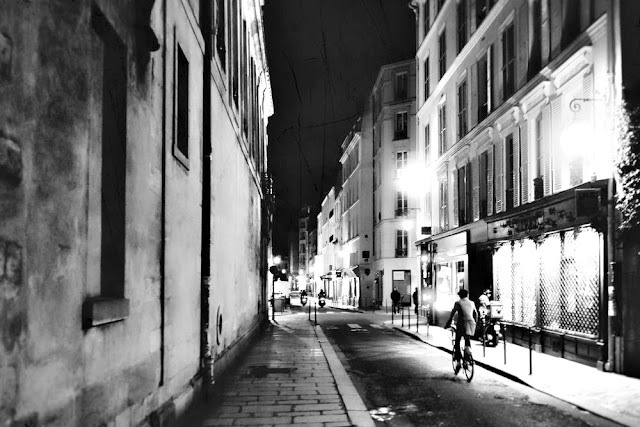 I have posted almost 70 entries to this blog. 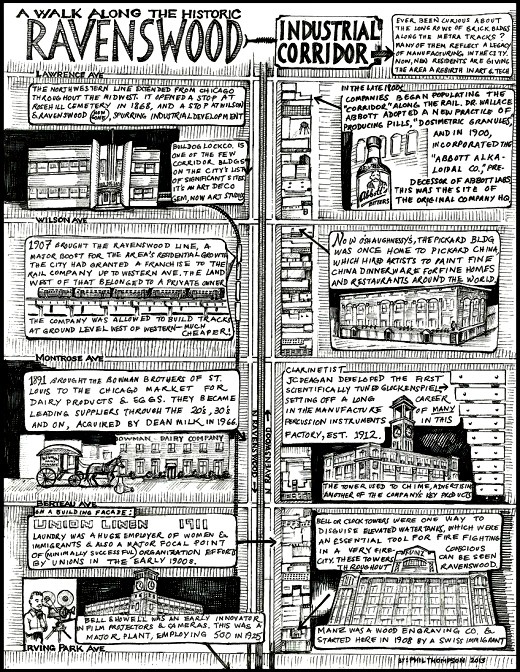 You can contact me at lvhistorical@gmail.com if you wish to add to it. Feel free to comment/question on anything in particular including spelling and grammar errors. I add text and images all the time. 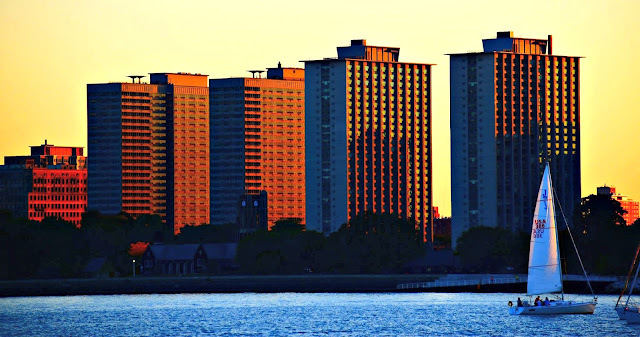 Please read my post regarding my sources for this blog called Blogger & Sources. 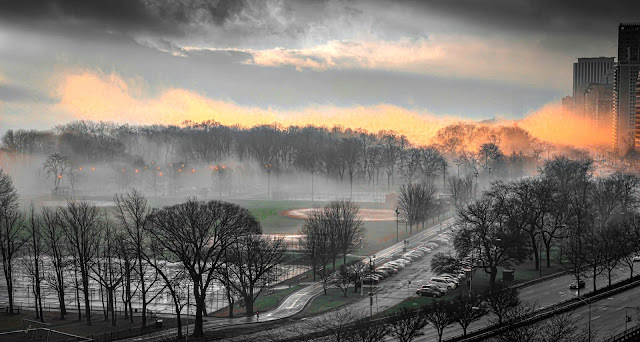 I am sure there are more knowledgeable individuals then me and better writers that can enrich this site. 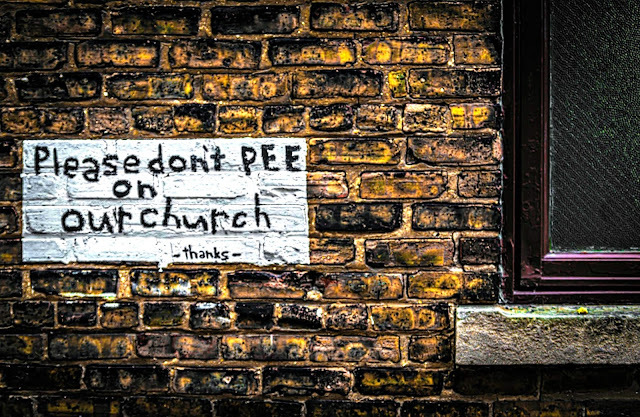 I welcome your insight!